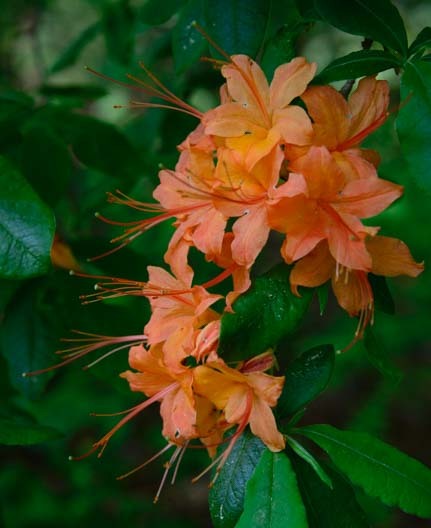 May, 2015 – As we took our RV north through Virginia, hopping on and off the Blue Ridge Parkway, we followed the blooming of the rhododendrons as they blossomed first in the south and then in the north. 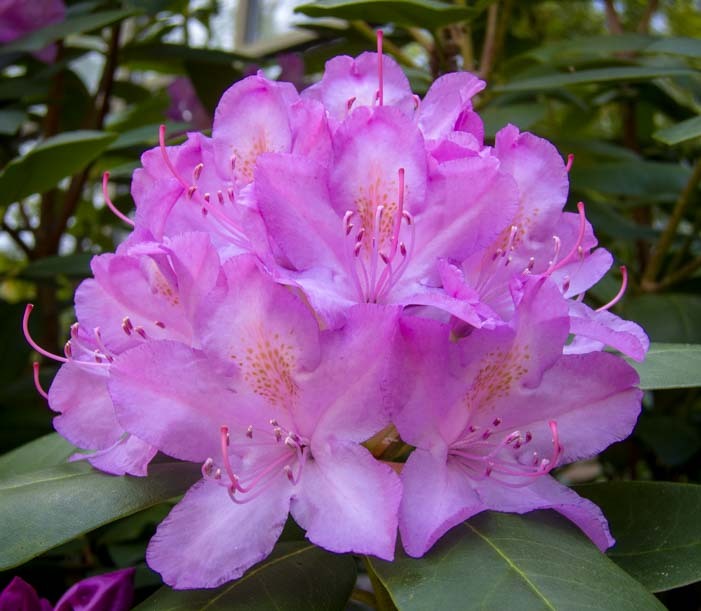 In fact, we followed the rhododendron bloom all the way from the Smokies to northern Maine over the course of five weeks! We also decided to contine the travel theme we had begun in the southern part of the parkway in North Carolina: Waterfalls. 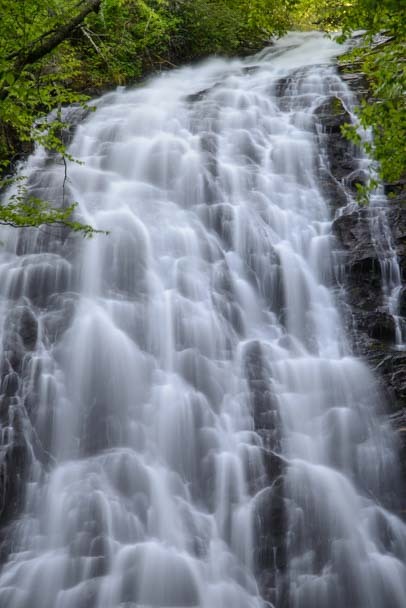 Seeing waterfall pics is very inspiring, but actually getting to them on a hiking trail usually involves a lot of vertical hiking, either climbing up to the top of a waterfall or scrambling down to the bottom of one. 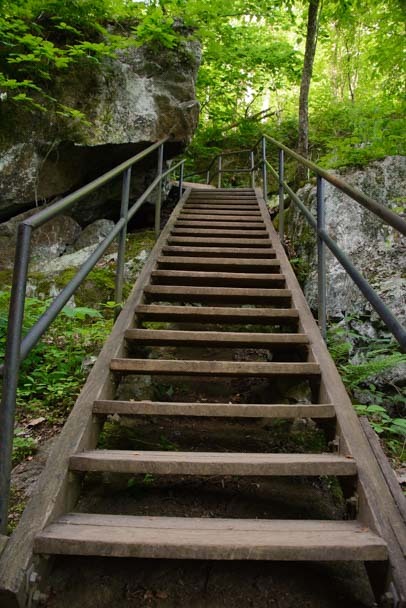 We got some great stair-stepping workouts on our quest for beautiful waterfalls in the Virginia portion of the Blue Ridge Parkway! The first waterfall we went to was Apple Orchard Falls. 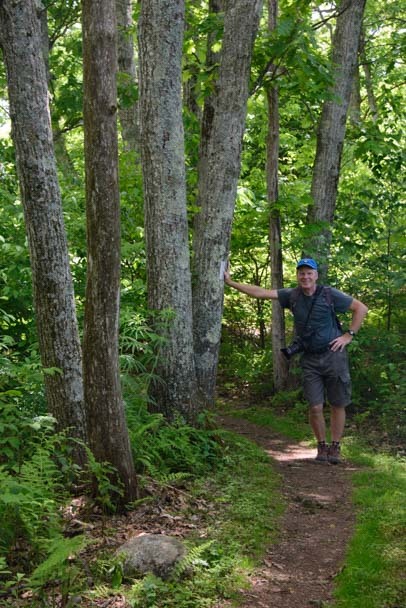 This hiking trail crosses the Appalachian Trail, and we were astonished as we approached the intersection with the Appalachian Trail to meet a fellow who was spending his summer hiking from Georgia to Maine! 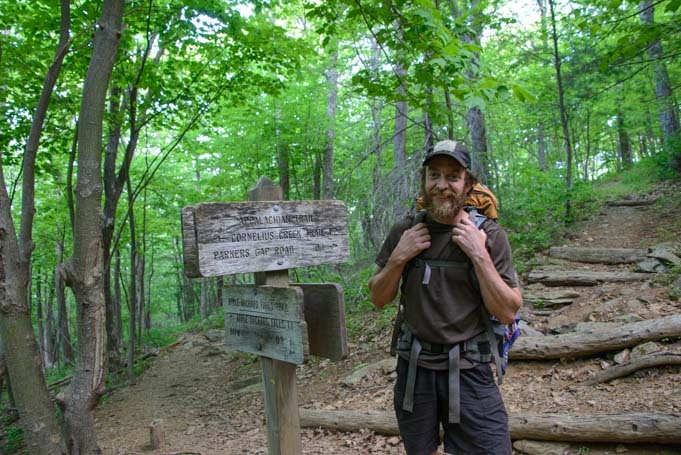 This hiker, Brian, was traveling light for a 4 month walk in the woods, but he said he was doing great. Unlike most of his fellow hikers, he hadn’t had to replace his hiking shoes yet, and he’d knocked out 770 miles of the trek with another 1,400 or so to go before he reached Mt. Katahdin in Maine. Brian is walking from Georgia to Maine this summer, and we met him 1/3 of the way into his trip. We bounded down the trail to the bottom of Apple Orchard Falls after that encounter, so excited to have met an Appalachian Trail through-hiker in the middle of his journey. At the bottom we found a pretty waterfall cascading over the rocks. 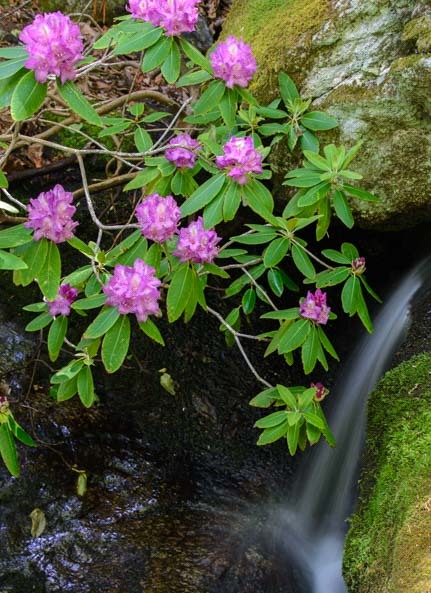 Better yet, there were rhododendrons blooming all around the lower part of the waterfall and even more along the stream that fell loosely over the rocks into the woods. We were in seventh heaven running around taking pics. In no time we were in our own worlds, totally separated. It was long after we were out of sight of each other that we realized we’d left our trusty two-way radios in the truck. 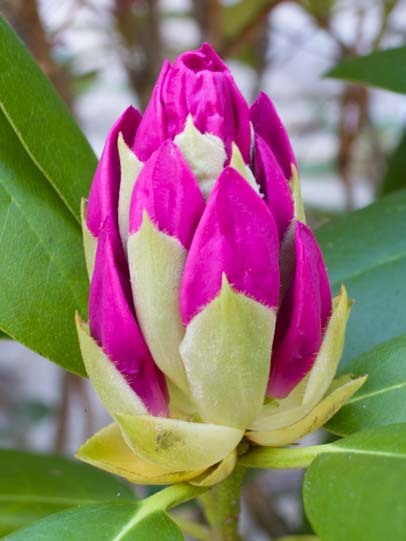 I had no idea where Mark went, but I followed the rhododendrons! 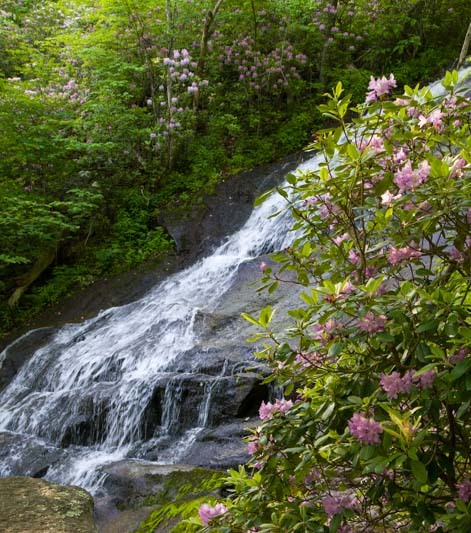 When I’d had my fill of rhododendrons and waterfalls, I hiked back to where I’d last seen Mark at the bottom of the falls. I searched around there for a long time wondering where he’d disappeared to along the creek. I yelled his name, bunches of times, but there was no answer. Oh no! The return hike to the truck was a one and a half miles or so straight uphill. This trail was STEEP, and I was torn. Should I stay at the bottom? Should I go back to the top? I finally decided to take the chance that he had gone back to the top. It was late, after all, and if he couldn’t find me I figured he’d return to the truck up top. I hiked nervously straight uphill, sweat pouring down my back. What if he wasn’t at the top? I wondered. Would it make sense to go back down to the bottom to look for him? And what if I couldn’t find him down at the bottom? Should I then hike back up again? At exactly what point would I try to get help? And how many miles away would help be? And would those helpful people then hike to the bottom to look for him this late in the day or wait til tomorrow? What if he’d gotten injured and couldn’t move? My imagination ran wild. I continued yelling for him periodically, morosely envisioning the headlines, “Dead hiker found at waterfall, two-way radios found in truck.” How foolish of us! As I hiked the last 100 yards straight uphill I craned my neck looking for the truck. When I finally caught a glimpse of it just beyond the last tree, I saw the door was open and Mark’s smiling face poked out from behind it and we both ran and gave each other a huge hug. What a relief! The next hike proved much more straight forward. 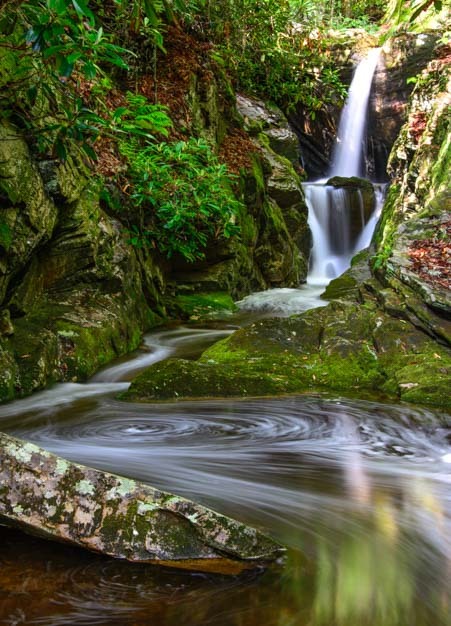 Fallingwater Cascades is just five miles away from Apple Orchard Falls, and is a much shorter and easier hike. 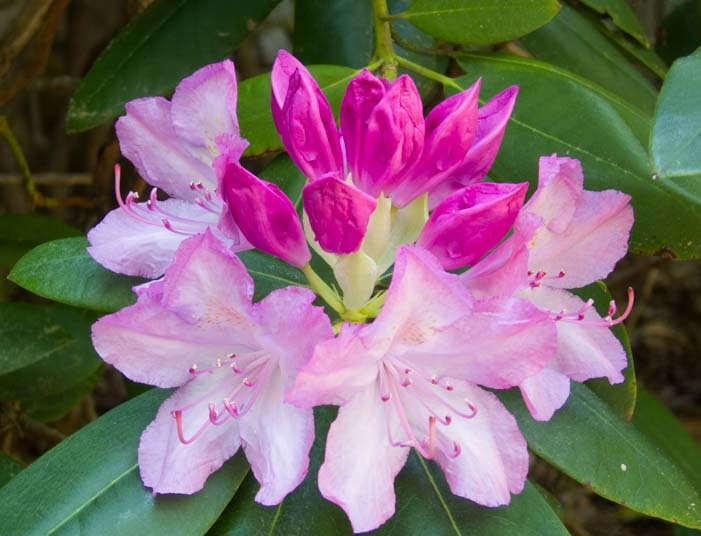 The rhododendrons were blooming here too, but I stayed on the trail this time. The waterfalls were lovely. 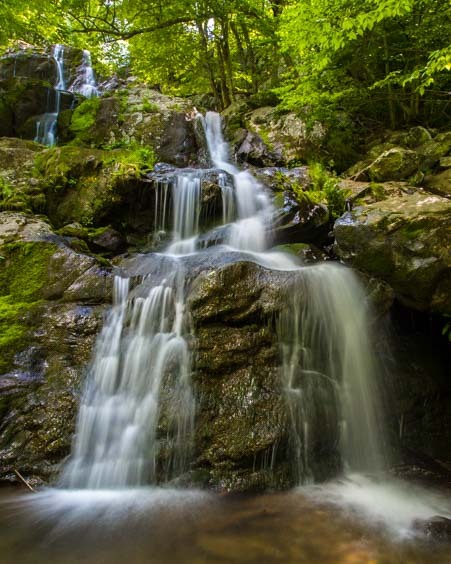 Our final waterfall hike along the Blue Ridge Parkway in Virginia was Crabtree Falls. 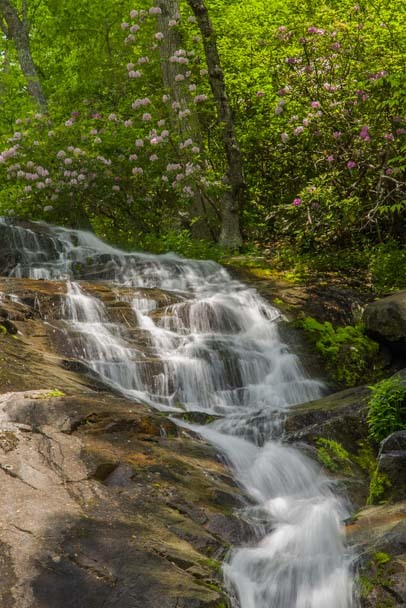 When we saw the name of this waterfall we did a doubletake because we had already hiked a Crabtree Falls in the North Carolina part of the Blue Ridge Parkway a week or so ago. 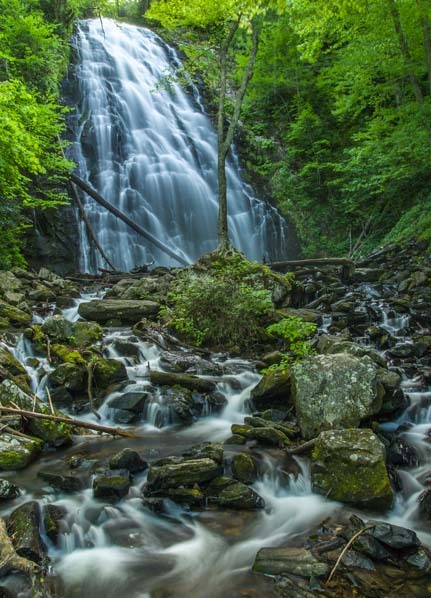 So we were surprised when the gal at the visitors center who told us about Crabtree Falls in Virginia had never heard of the one in North Carolina. 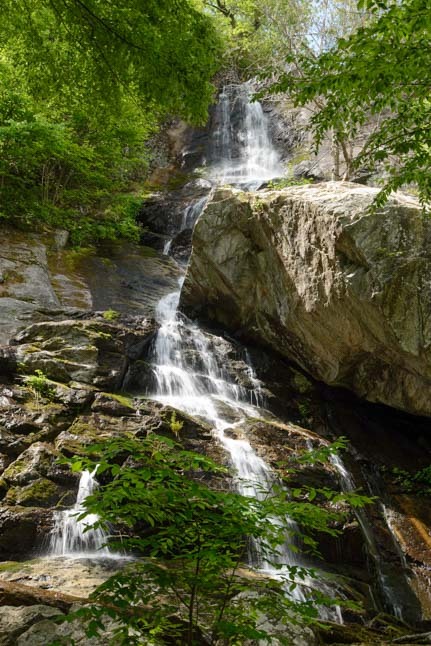 However, the Virginia falls is the tallest waterfall in the east, a claim to fame the North Carolina Crabtree Falls doesn’t have. 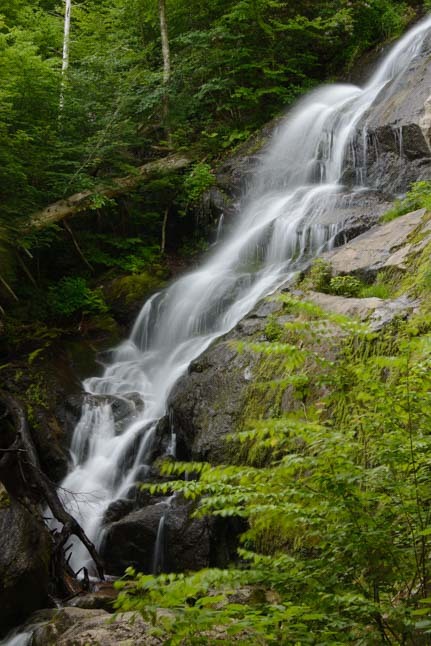 We found out that when you hike the tallest waterfall in the east, you are in for a LOT of stair climbing. 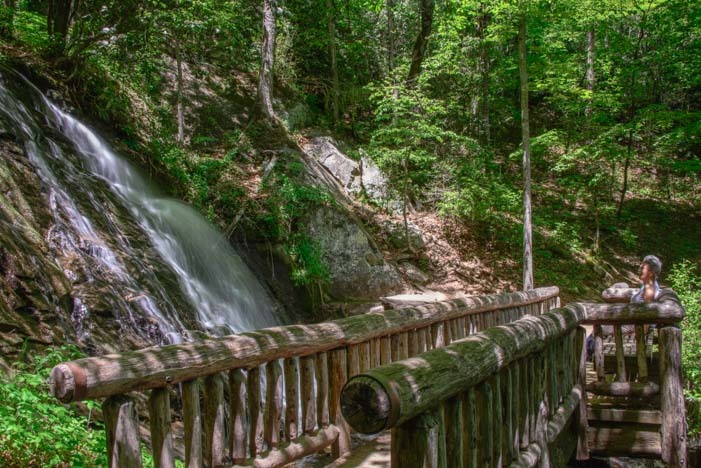 Crabtree Falls consists of three waterfalls sections that are each unique, and between each section there are staircases and some steep trails. 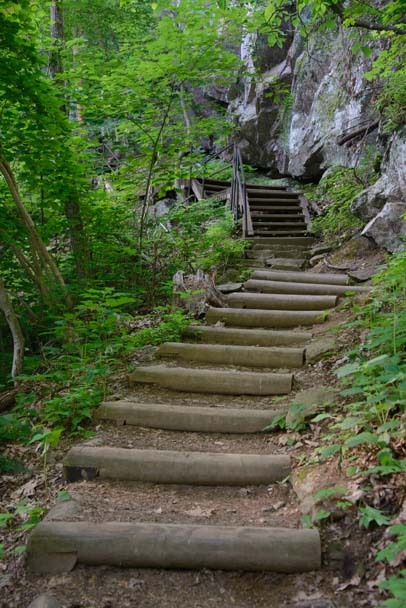 Not only is this hike steep, but there are a ton of stairs! Each staircase brought us to more waterfalls. And then we climbed more stairs!! Some stairs were built into the trail. Others were just plain old staircases! In some places the stairs look natural, and in some places they are just staircases. After the stairs we saw another bit of the waterfall. 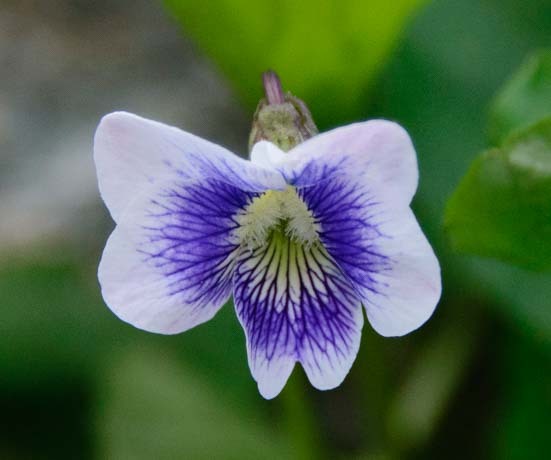 Different shape. Same falls! As we climbed higher, we got more and more tired. And obviously the rangers did too, because up near the top they quit building stairs and just let the tree roots be the stair cases! 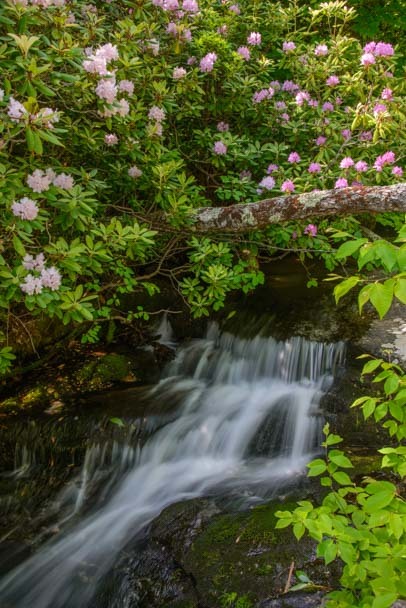 At the very top of the waterfall, the stream flowed between the rhododendron bushes and then fell right out in front of them. Just beautiful. And this time, since we had started the hike at the bottom and had climbed to the top, we gleefully ended our hike by descending down the stairs instead of trudging up!! 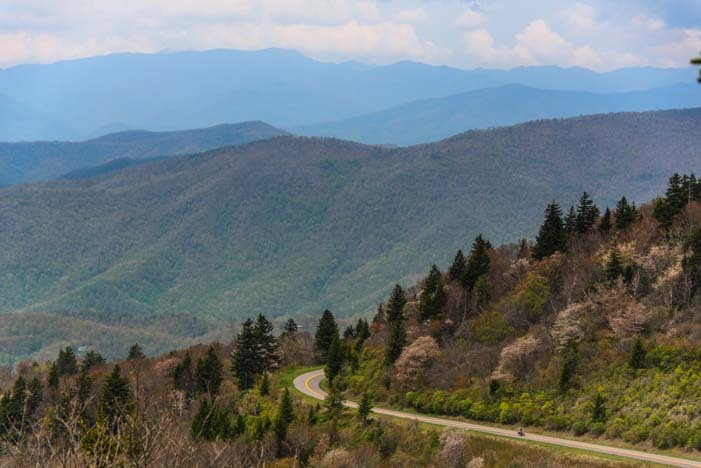 If you take your RV along the Blue Ridge Parkway, the parkway itself is fine for driving except for two low bridges at the far south end in North Carolina. 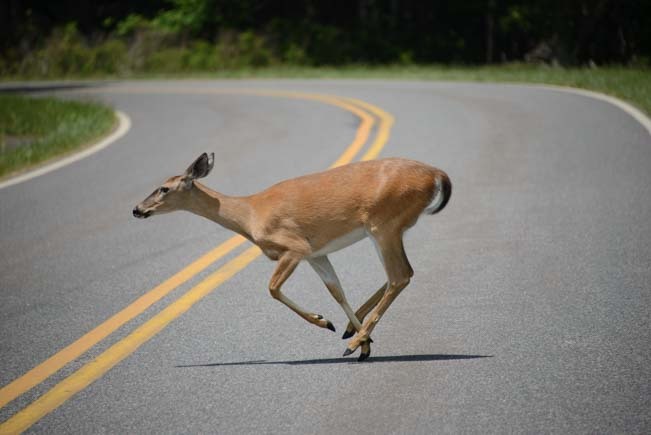 No matter where you drive in this area, be prepared for steep hills. 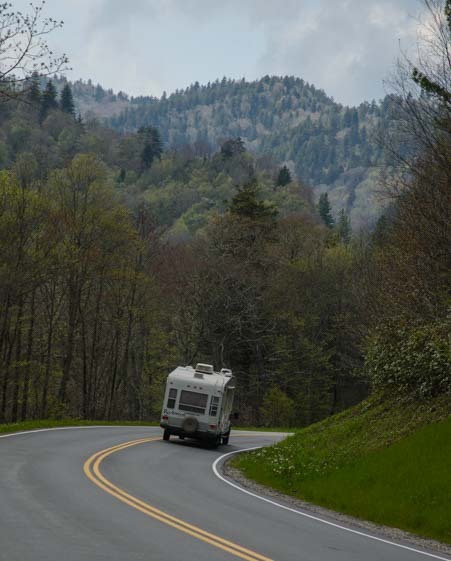 We were very grateful driving in these hills to have recently outfitted our truck with a diesel engine tuner to improve its towing power and to have outfitted our trailer with electric over hydraulic disc brakes. 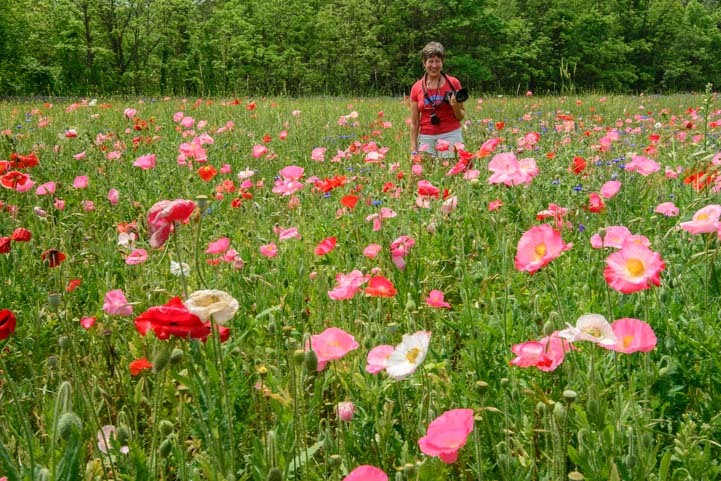 Blue Ridge Parkway Highlights (Virginia) – Mills, Music & Farms! 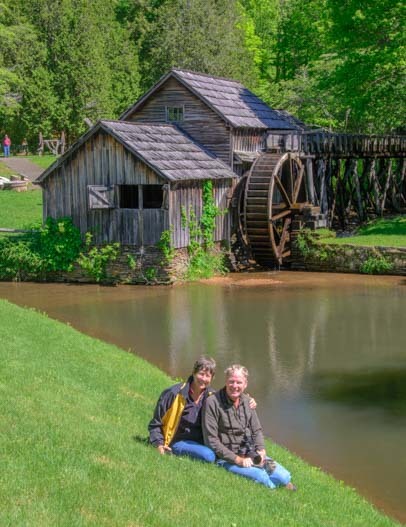 May, 2015 – As our RV travels along the Blue Ridge Parkway took us north from North Carolina over the border into Virginia, we stopped at the Mabry Mill. This beautiful old mill was built by one Edwin Mabry who used it to grind corn and saw lumber for his neighbors in the early 1900’s. 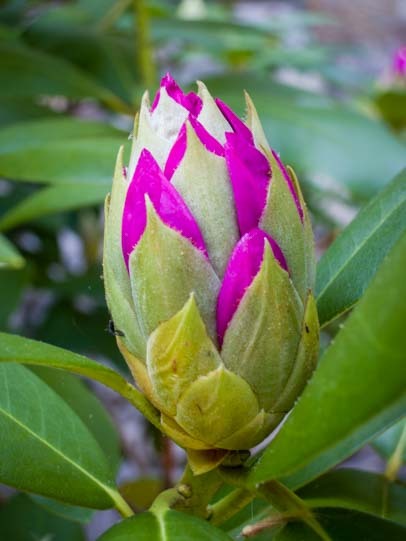 We arrived in in the third week of May, just as the rhododendrons began blooming. There is something about an old wooden building like this with flowers and a paddle wheel outside that just begs to be photographed. Especially when water is splashing off the paddle wheel! 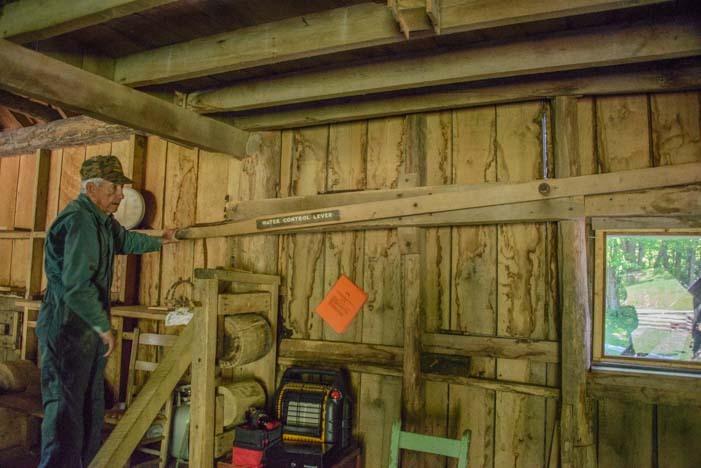 Inside the mill, an old fellow showed us how a very long lever arm is used to start and stop the flow of water over the paddle wheel. This effectively turns on and off the power that the wheel generates. It also explained why, when we were outside taking pics, the paddle wheel would periodically turn and dump some water and then stop spinning and sit still for a while. The guy inside was showing people how it turned on and off! A long lever arm controls the water flow to the paddle wheel. Visiting places like this always makes me marvel at how easy so many things are today. 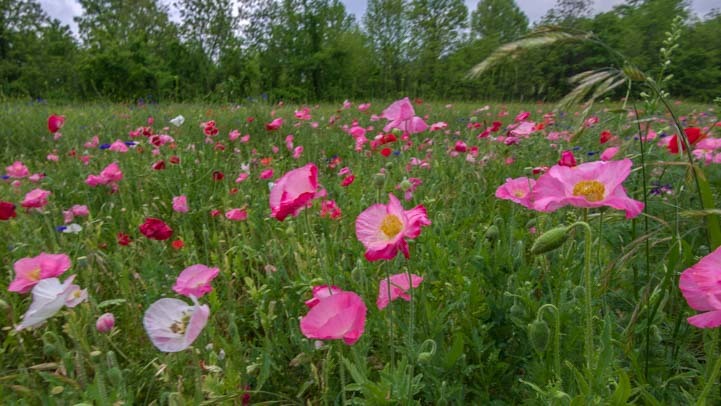 What a huge effort it was to grow grains, harvest them, separate out the seeds to be ground, take a bag of them to your neighbor’s mill to get it ground, and then go home and bake some bread. I would cherish every slice of that loaf! 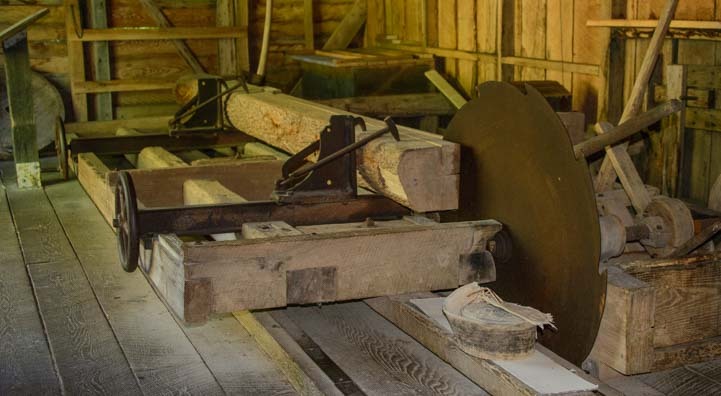 The old mill saw — powered by the paddle wheel! 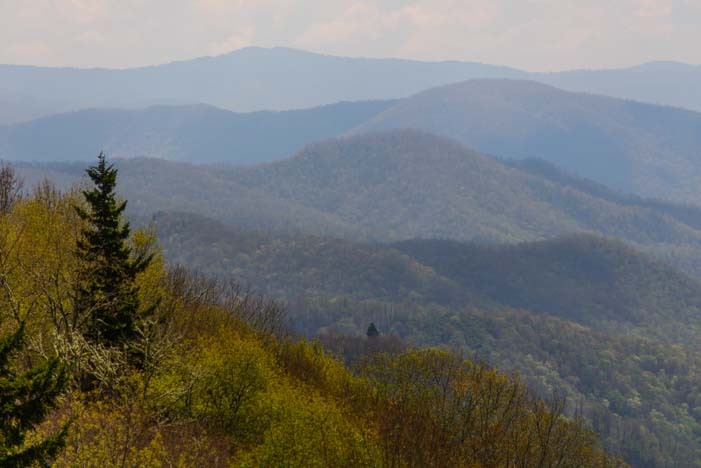 As we drove on the Blue Ridge Parkway, we found that much like the Smoky Mountains a little further south, the views out across the mountains and valleys form layers that fade into the distance. 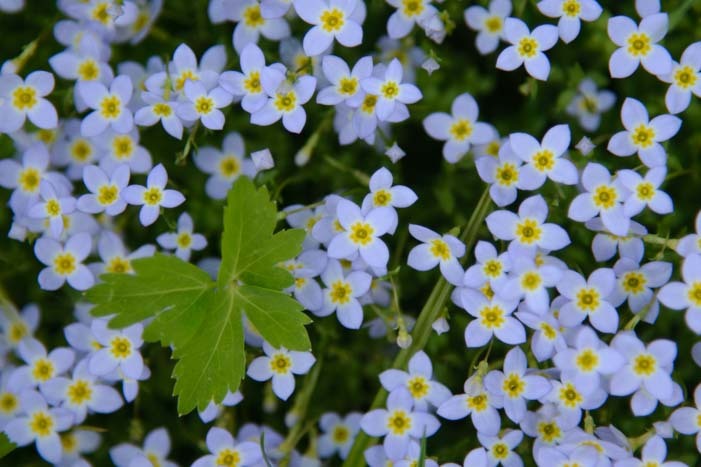 “Smoky” and “Blue” are very apt names! Just a bit south of the Mabry Mill on the Blue Ridge Parkway, we visited the Blue Ridge Music Center. 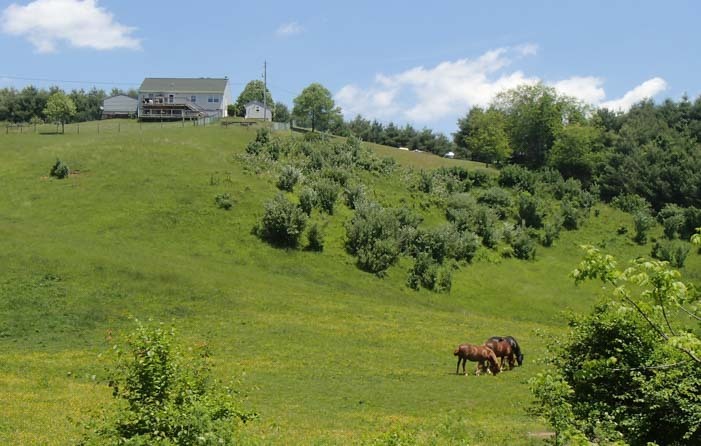 This fantastic little museum is maintained by the National Park Service, and it explains the history of bluegrass and mountain music. 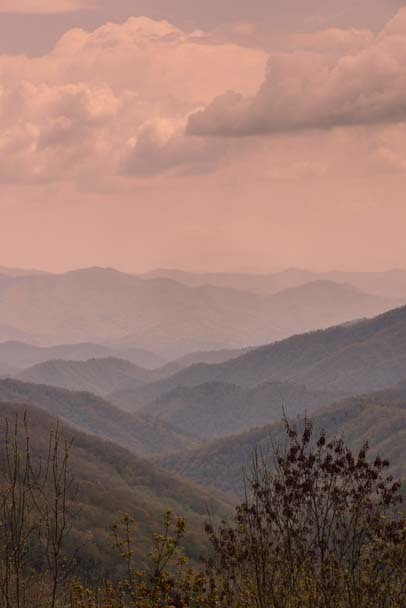 We discovered that bluegrass is an amalgam of all the musical traditions from the people that were living in these mountains over a century ago. 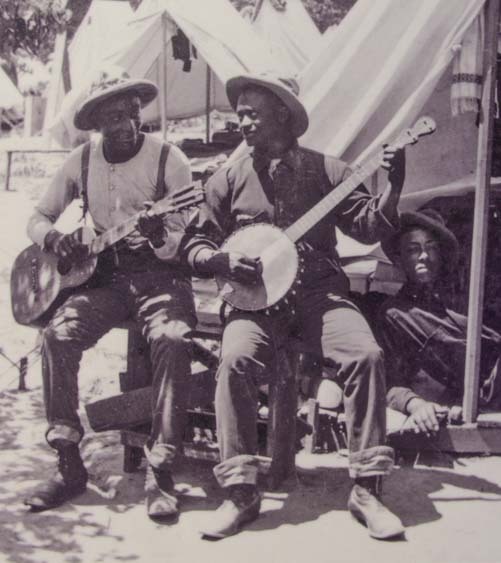 I had never known this, but the banjo is an instrument that was brought over from Africa! The lyrics, patter and general style of bluegrass music can be traced to traditional Irish folk songs. And the purely vocal harmonizing has its roots in German liturgical music. 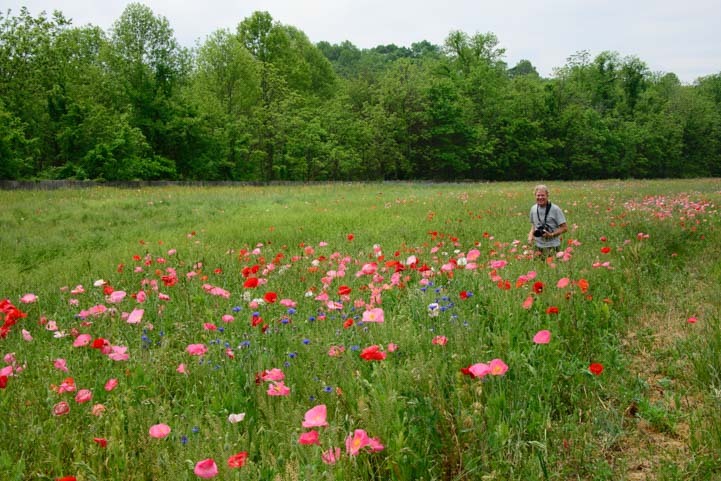 All of these different kinds of musical traditions blended together here in the Appalachian mountains, and over a period of time, bluegrass music emerged. The banjo came from Africa! The best part of the Blue Ridge Music Center is that it’s not just a museum. It’s a place for enjoying music! Every afternoon from noon until 4 pm, musicians perform for free in the breezeway which is a big open room right next to the museum. It has a large barn door that can be left open to make the room airy and breezy or can be closed. It’s very informal. Folding chairs are set up in front of the performers, and people come and go, enjoying the music all afternoon. 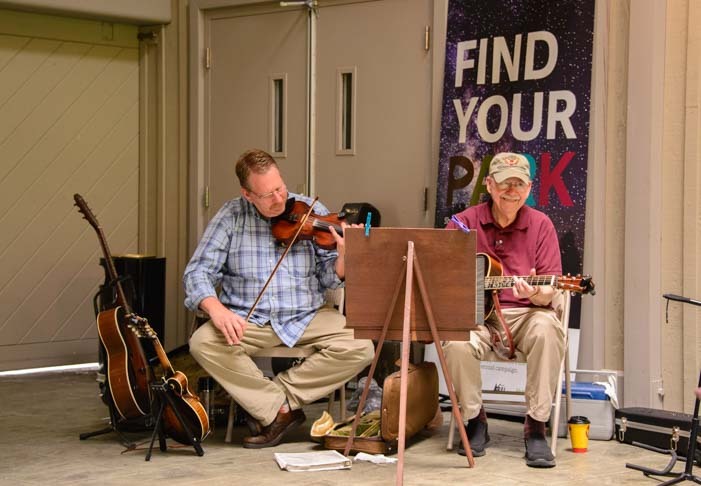 Scott Freeman & Willard Gayheart perform bluegrass music for tourists courtesy of the National Park Service. Different musicians play for free for 4 hours every day!! 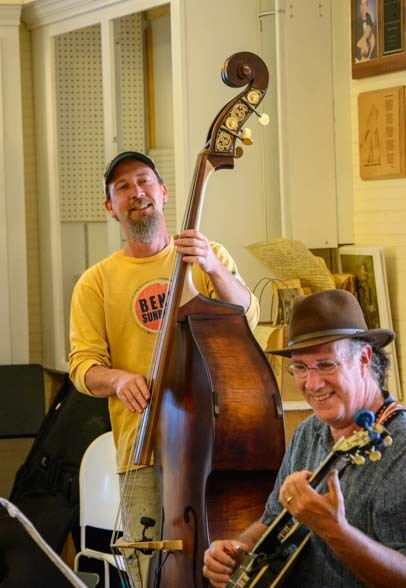 We saw Scott Freeman & Willard Gayheart while we were there, and we were floored by their wonderful playing. For those who want more music, the Blue Ridge Music Center hosts a complete outdoor summer concert series that takes place on a stage in front of a big lawn. 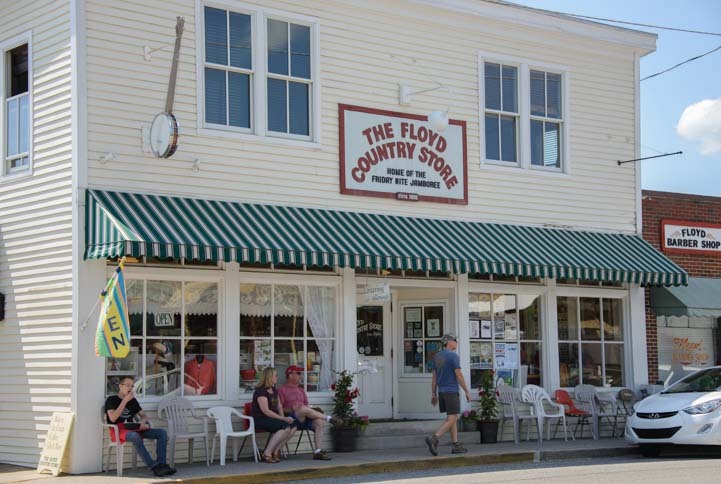 Just 40 miles away in the town of Floyd, we found that there is all kinds of blue grass and old time music going on for free, or close to free, in the Floyd Country Store (blog post here) — and what a great time we had there! 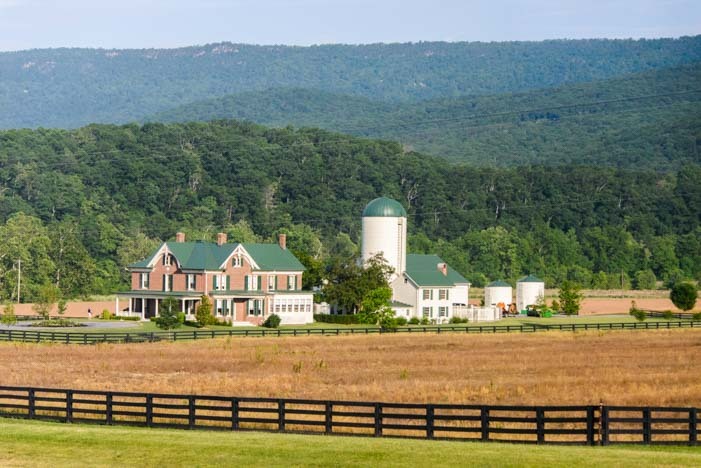 Quietly defiant Floyd Virginia hosts free bluegrass concerts. 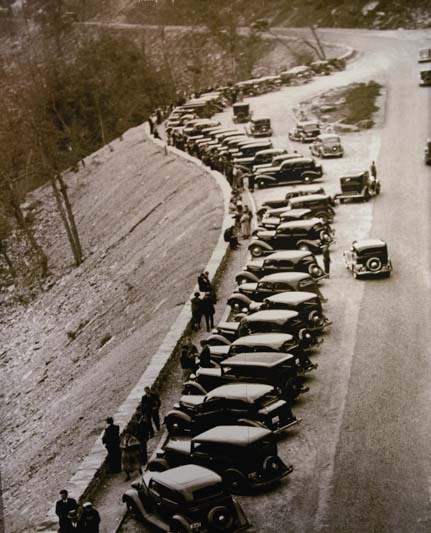 They sometimes spill out onto Main Street, even though it’s a major state thoroughfare! 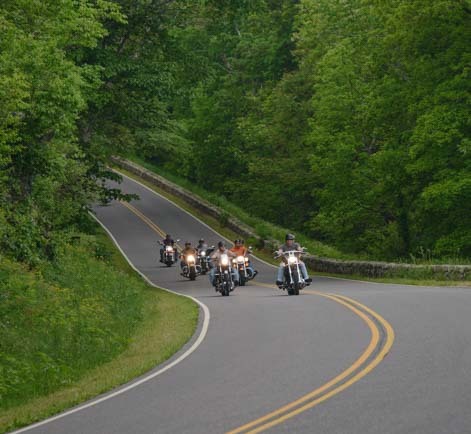 We traveled on the Blue Ridge Parkway itself a little, but we did most of our driving on the roads that criss-cross the parkway and run parallel to it. 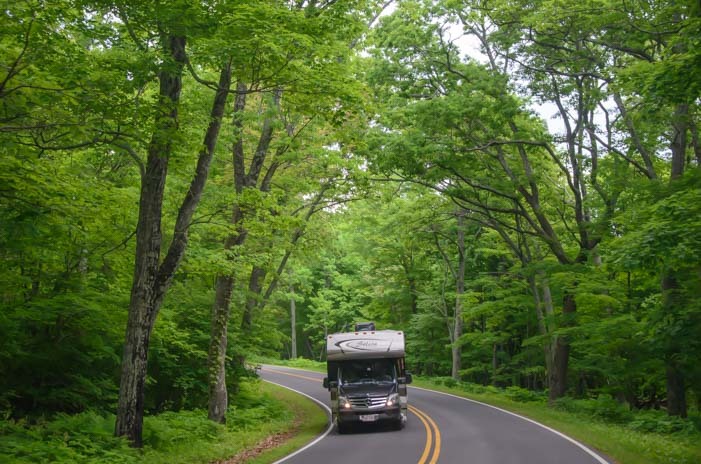 This is an extraordinarily hilly area, and we found ourselves constantly driving either up a steep grade or down one, which made us very happy we had done the disc brake conversion upgrade on our trailer a few months ago in Texas. 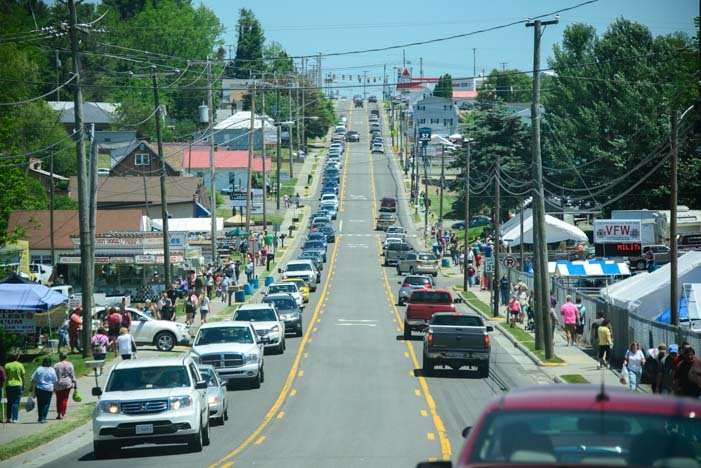 As we approached Hillsville, Virginia, on Memorial Day Weekend, we found ourselves not only in the hills but caught up in some really crazy traffic as the whole town put an enormous yard sale as part of their Memorial Day Flee Market! 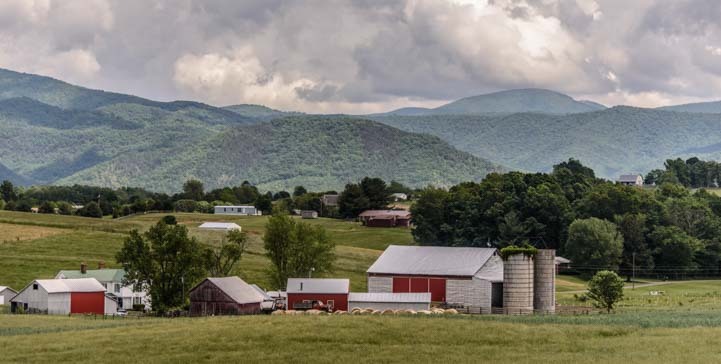 But as we ventured north, taking in some of the highlights of the Blue Ridge Parkway, whenever we got away from the cities and towns, the countryside became wonderfully rural, and we passed one beautiful farm after another. We saw lots of farms as we drove around. We even passed an old RV parked next to some very tidy rows of vegetables. A vintage RV with new crops coming up. This is a pretty part of the country! 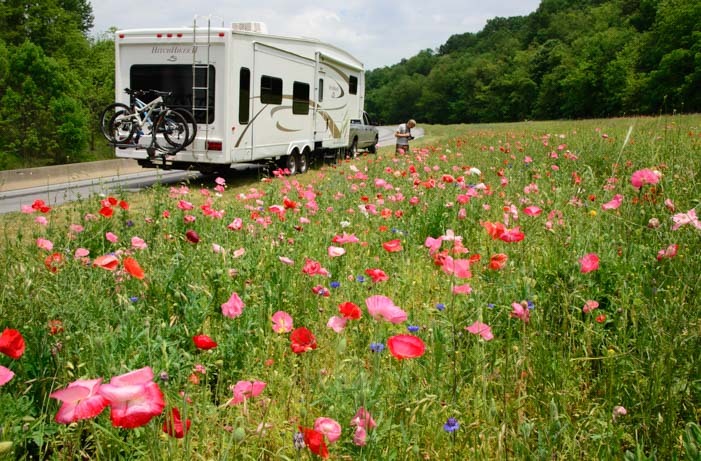 If you take your RV to the Blue Ridge Parkway, you’ll find mills, music, farms and much much more! 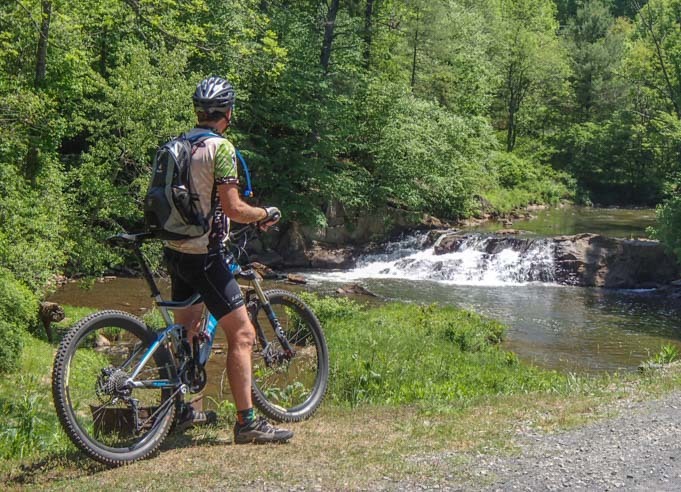 New River Trail State Park – Galax, VA – Pizza, Beer and Biking! 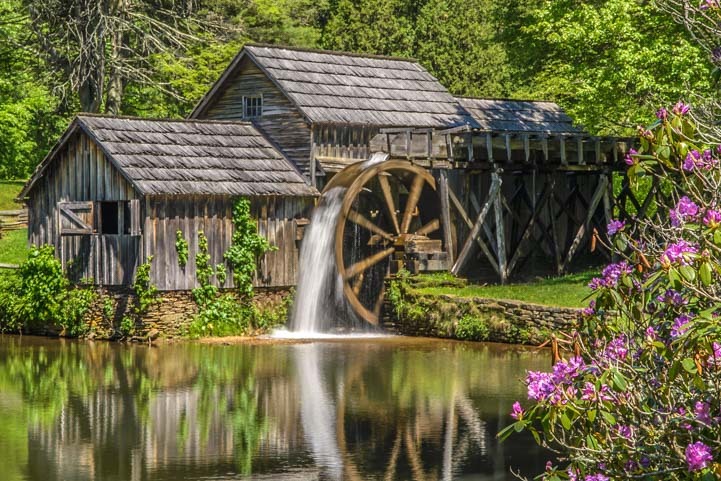 May, 2015 – After seeking out the waterfalls of the Blue Ridge Parkway in North Carolina, our RV travels took us over the border into Virginia to the town of Galax (pronounced “Gay-lax”) where we planned to see two famous Parkway attractions: the Mabry Mill and the Blue Ridge Music Center. 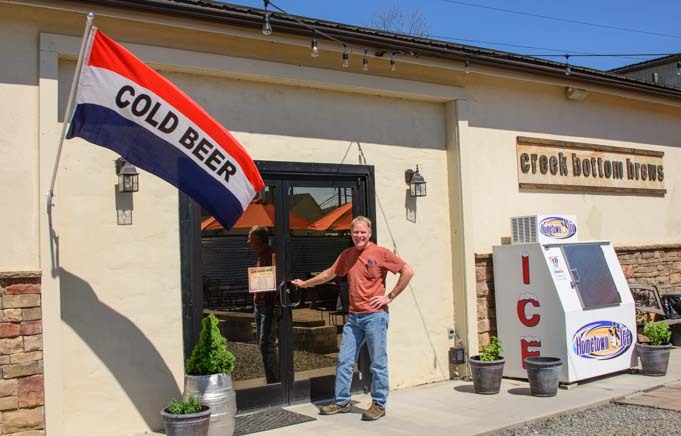 However, when Mark spotted a microbrew pub in town — Creek Bottom Brews — our truck automatically steered itself right to the front door! Creek Bottom Brews welcomes us in. 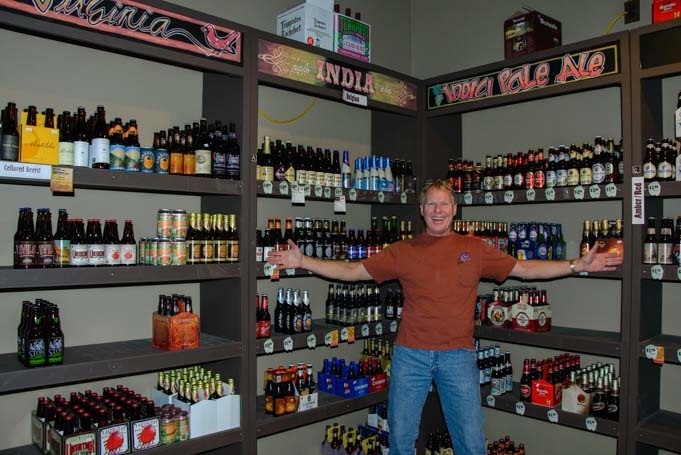 Inside, Mark found himself in craft beer heaven. The walls at one end of the brewpub were lined from floor to ceiling with individual craft beers from every brewery he’d ever heard of, and even a few more. What’s better, the bartenders were pouring pints of unusual craft beers from around the country as fast as the tap handles could go. The place was filled with very happy looking customers. We ordered a pizza to go along with the Thunder Bay Brewing pale ale they had on tap. I don’t know if we were starving or what, but that was by far the best beer and the best pizza we’d had in a really long time. What a great place! We never ever do this, but we went back again the next night for the same exact thing, and then we went again for a third time the night after that! We became Creek Bottom Brews regulars in just three days! Is this beer heaven or what? As we happily sat there enjoying this truly awesome pizza and beer each afternoon, we noticed that lots of the folks around us were dressed in cycling duds. What was going on? Many of them just buzzed in to get their growlers filled or to pick up a six pack of something exotic. Apparently this was how these Virginia folks rehydrated after their rides! The next morning we hit the trail! 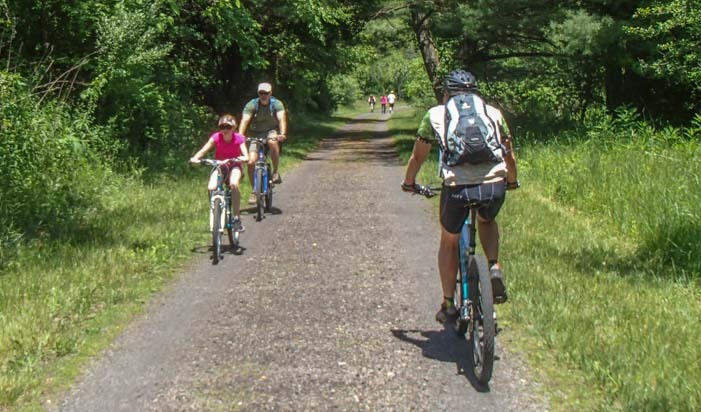 The New River Trail is wide and flat and easy to ride on. Oh my, what a terrific Rails-to-Trails system this New River Trail is. We were blown away. It was one of the best Rails-to-Trails rides we’ve done, right up there with the 72-mile Trail of the Coeur d’Alenes in Idaho. It is wide and flat and winds along the New River for 57 miles. And for such a great trail, we were amazed that on the Saturday of Memorial Day Weekend there weren’t all that many people on it. 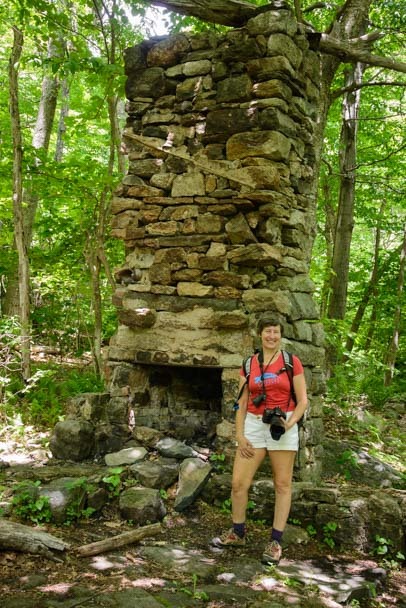 The fun thing about this really scenic trail is that it passes by all kinds of interesting things. We came across a small waterfall and stopped to take pics. We enjoyed a small waterfall along the way. And we stopped at the old Cliffview Station depot building. 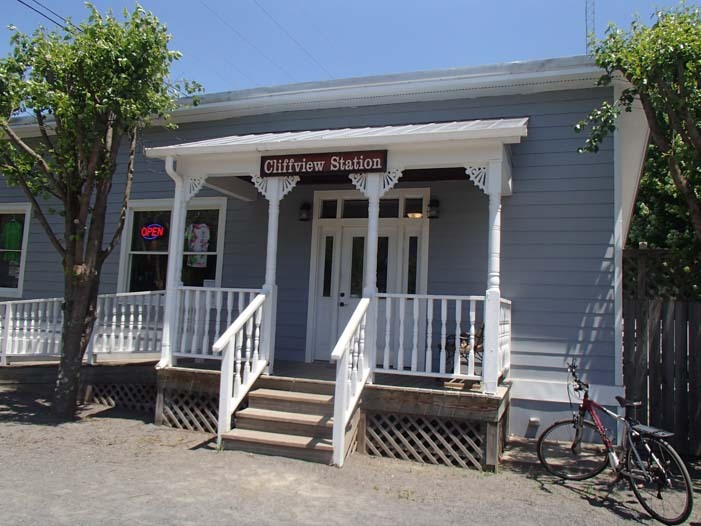 Cliffview Station is an old depot that makes a fun stop. There was also a very cool wooden bridge that was fun to ride across. We loved this curved wooden bridge. Much of the trail went along under a canopy of trees, but there were lots of open areas too where we saw horses grazing in the fields. There was lots of interesting stuff to see along the way. What I loved is that this is a trail for everyone. We saw families out biking on cruiser bikes and we saw more serious folks on fancy mountains bikes. Some people were even out there on road bikes. The trail was wide and flat and smooth enough for any kind of bike. And of course there were walkers and joggers too. We saw families and old folks alike out on the trail. 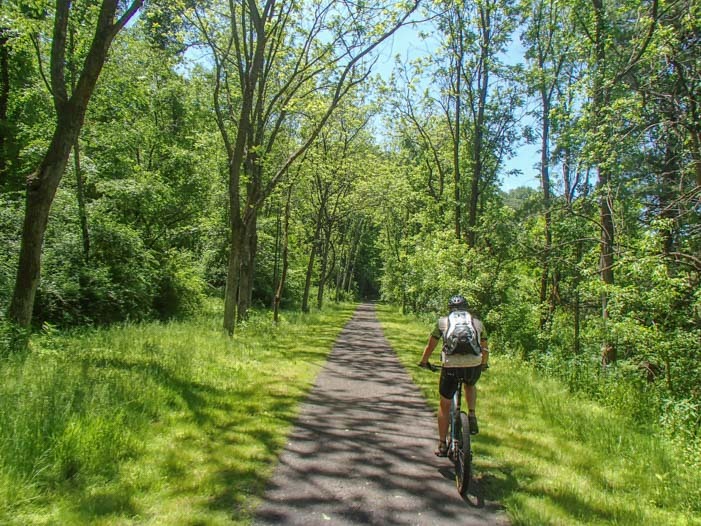 The New River Trail is part of the Virginia State Parks system, and we got talking with a ranger and learned that this trail was actually donated to the state by the Norfolk Southern Railroad back in 1986. 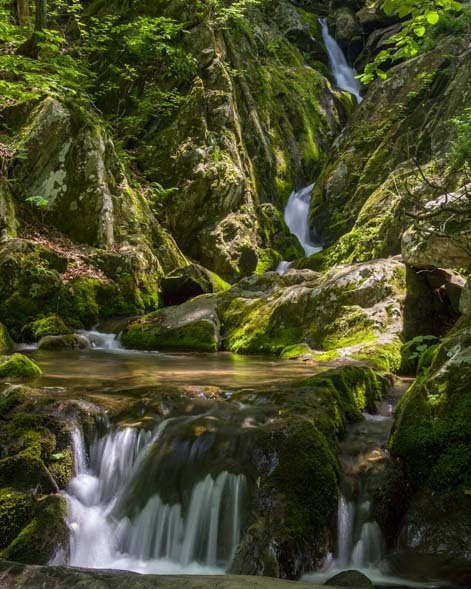 Political wrangling got in the way of its management for a while, but now it is a true jewel in Virginia’s state park system. Every kind of bike rolls well on this trail. 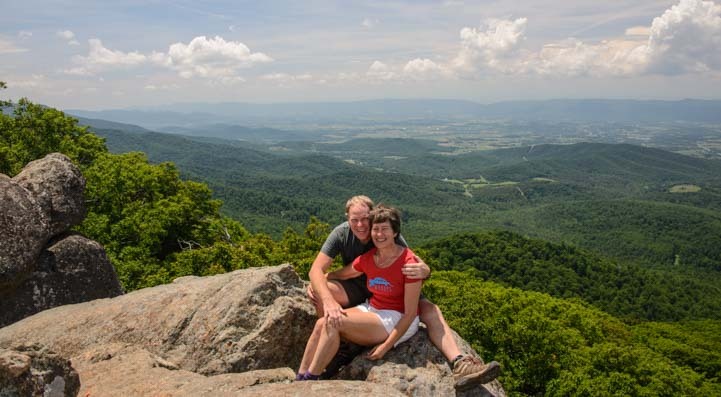 We were amazed to learn from him that even though they operate on a shoestring budget compared to other states, Virginia State Parks has been rated the top state park system in the country. 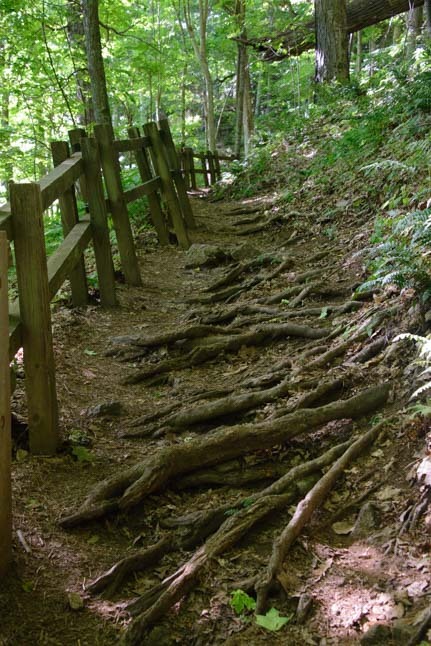 The care with which this trail is maintained is proof of why. 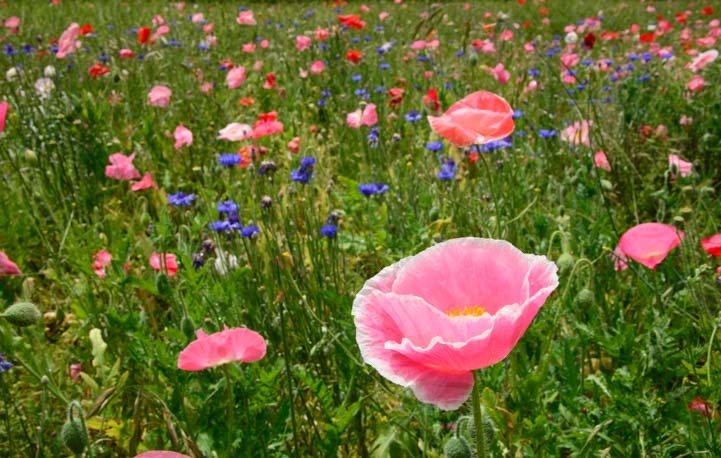 I can never resist the wildflowers! The trail has several campgrounds along its length, and we passed one of the campgrounds on our ride. What a fun place to pitch a tent! We saw quite a few cyclists who were touring with panniers on their bikes, and we met one couple who was doing a three day, two night ride out and back on the trail! 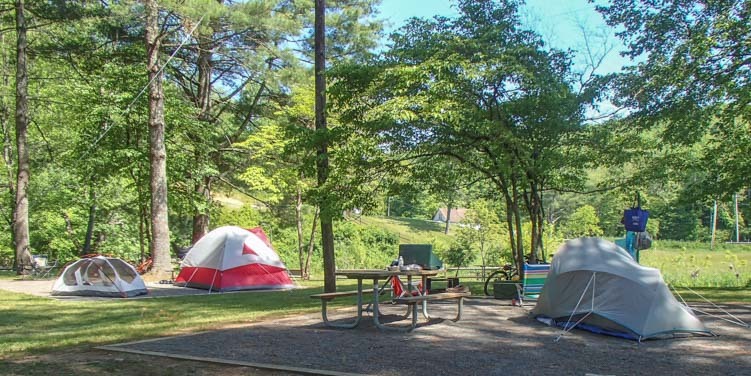 Tents set up at Cliffview Campground, one of several campgrounds on the trail system. We did about 20 miles round trip and then we just had to go back to Creek Bottom Brews. After all, that’s how the cyclists around here rehydrate after their rides, and we needed to rehydrate too! 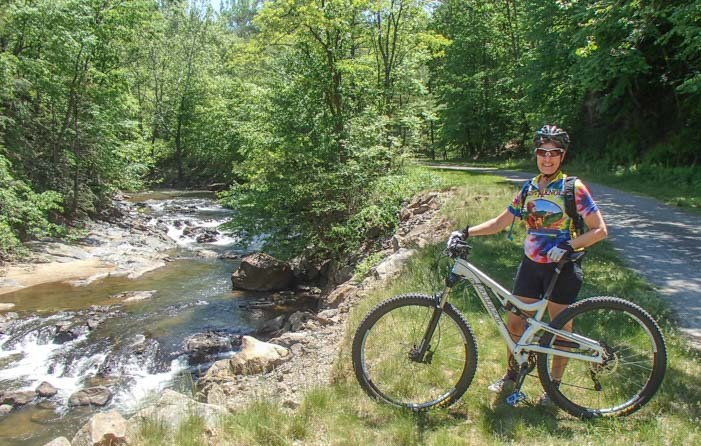 Come for the Blue Ridge Parkway, Stay for the Pizza, Biking and Brews! 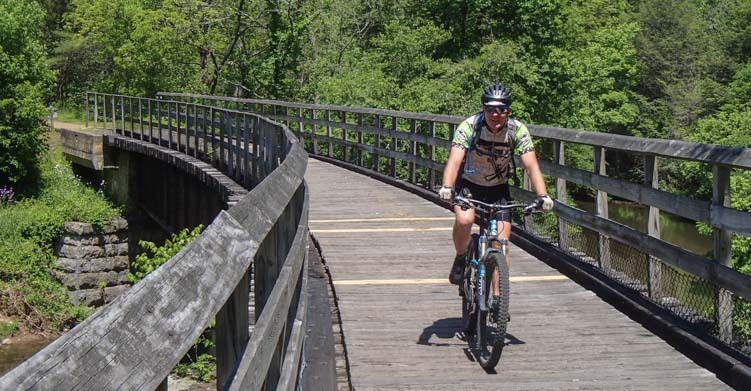 We sure were glad we stopped in for a beer — what better way to discover a cool bike trail?!! 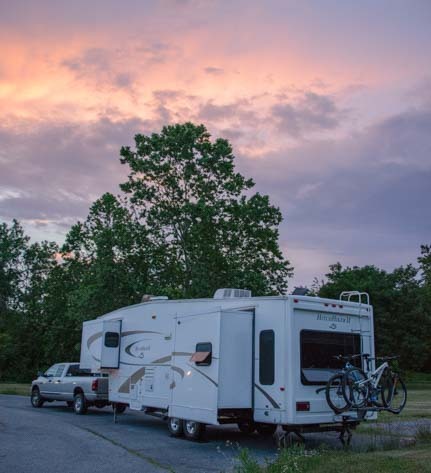 If you take your RV along the Blue Ridge Parkway in the vicinity of Mabry Mill and the Blue Ridge Music Center, take a little time out for a bike ride and a brew in Galax! 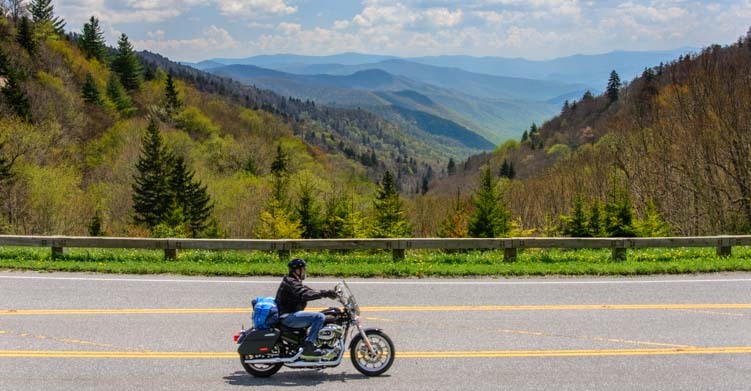 May, 2015 – The Blue Ridge Parkway is 469 miles long, and it creates a link between Great Smoky Mountains National Park down south in North Carolina with Shenandoah National Park up north in Virginia. It’s a very skinny road, and private land abuts it on both sides, so most of the attractions are just off of it to one side or the other. 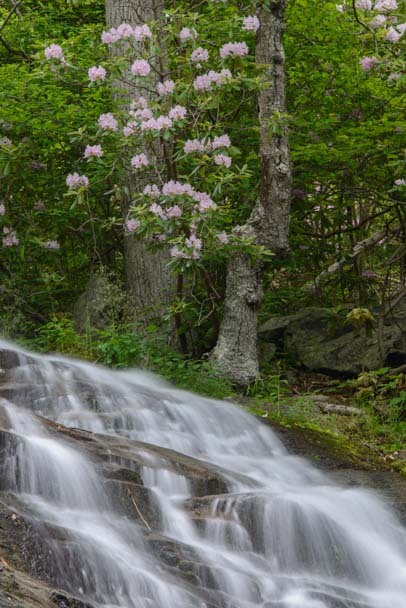 There is so enormously much to see and do along this long stretch of road that we decided we’d shape our Blue Ridge Parkway adventures by having a theme: waterfalls. 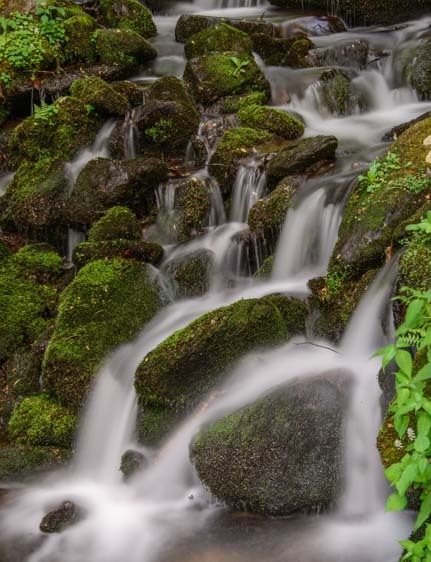 We’d had a lot of fun exploring some of the waterfalls in Great Smoky Mountains National Park, so we started hunting for more waterfalls as we traveled northeast along the parkway. The first one we went to was Soco Falls. It’s fairly close to Cherokee, North Carolina, where we’d been staying for a while. The hike down to Soco Falls is steep but quite short. There is a viewing platform partway down, but the real beauty of the falls lies well below that at the very bottom of the falls. We had to scramble a little bit on the slick muddy trail to get down to the bottom. 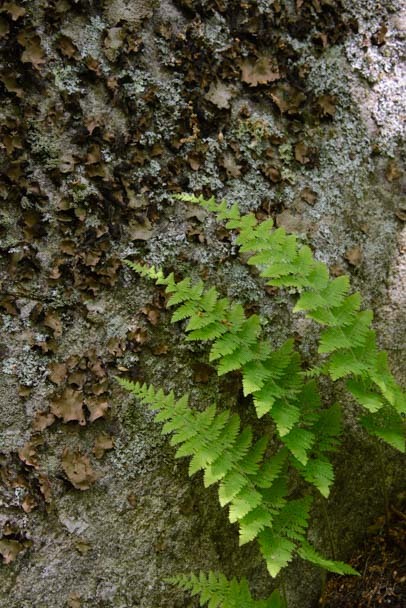 Luckily, there was a strong rope strung between some trees to give hikers a handhold in the steepest parts. Once we got down to the bottom, the view looking back up at the falls was spectacular. 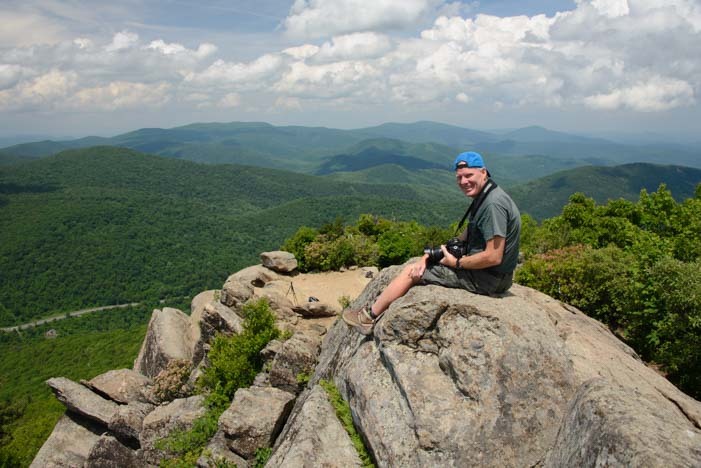 Hiking below the viewing platform takes you to the best views! A group of local kids was down at the bottom of the waterfall too, fishing. “Look, we’ve caught 8 fish!” one of them told Mark excitedly, holding up a small canvas bag in his grubby hand. Mark asked what they planned to do with them. “Eat them, of course!” the kid said, giving Mark a funny look. The kid vanished lower down the falls, and then came back up again a little while later. “What are you doing?” he asked Mark as he stared at his camera and tripod. When Mark said he was taking pictures, the kid asked what for. “To look at, of course!” Mark said. This time he gave the kid a funny look! 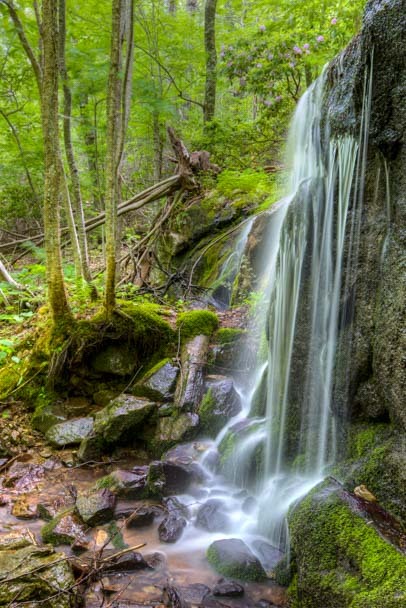 Whether you come to these falls to fish or to take photos to look at later, they’re wonderful. 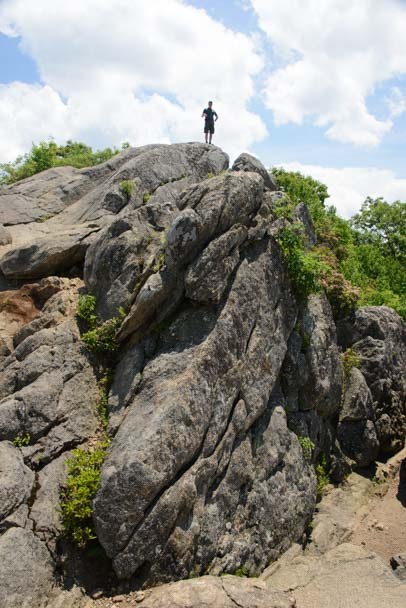 The hike to the bottom is well worth the little bit of extra scrambling to get all the way down, even if it’s muddy. 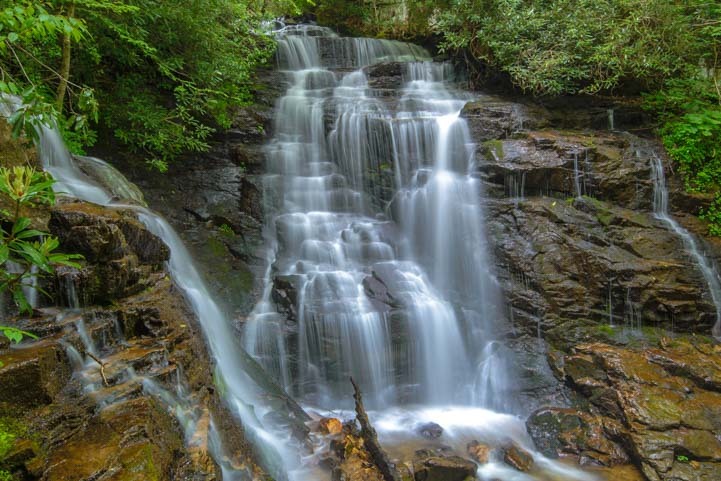 The next waterfalls we wanted to see were Linville Falls and Duggers Creek Falls which are both reached from the same trailhead parking area. 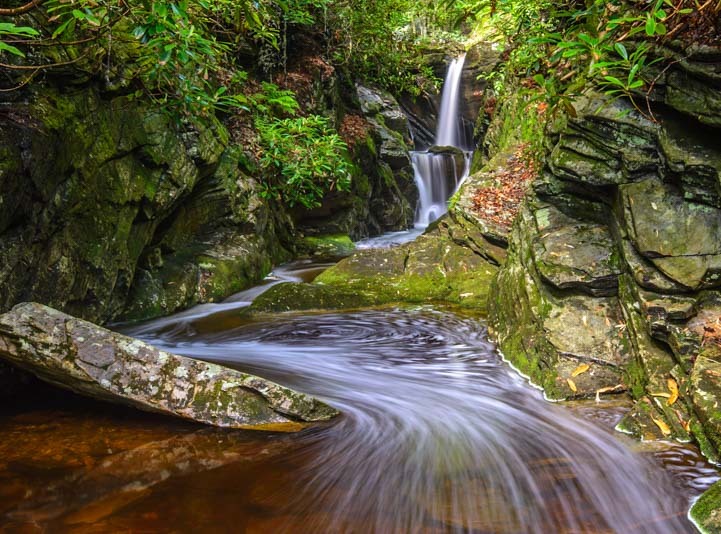 At the Linville Falls Visitors Center, we saw a breathtaking photo of Duggers Creek Falls and decided to do that hike first. The skies were getting dark, however, and we joked with the ranger that we really ought to buy two of the rain ponchos they had for sale, just in case. But we didn’t. In fact, Mark even left his rain jacket in the truck. 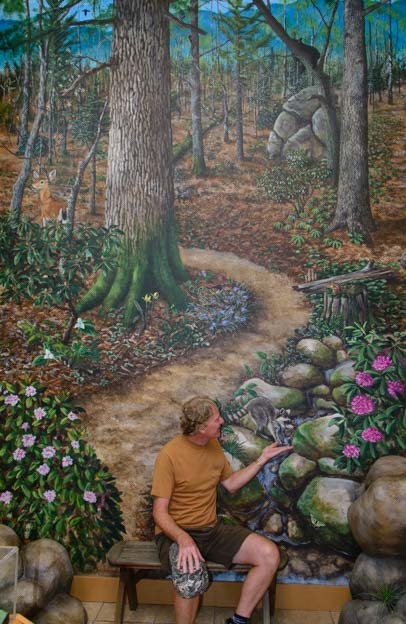 Mark feeds a raccoon on a painting at the Linville Falls Visitors Center. The hike to Duggers Creek Falls isn’t very long, and we had just gotten to the bridge down near the waterfall when the skies opened up. We hid out under a rock outcropping for a little bit, but the rain went from simply pouring to coming down in torrents. In no time, we were drenched, especially Mark without his jacket. We decided to make a run for it back to the visitors center. As soon as we walked in the door of the visitors center, Mark grabbed two rain ponchos off the shelf and slapped them down next to the cash register. Water was dripping from his soaking wet hair right down his nose as he handed the clerk his credit card. How funny! Of course, after about half an hour or so the sun came out. So, down the trail we went once again. This time we were not only both wearing our rain jackets but we had our nifty new rain ponchos tucked into our packs too. Surely, that guaranteed the sun would stay out! We took the shortcut hike from the far end of the parking lot this time, and when we got down to the bridge, the view of the waterfall was lovely. But the falls are set far back from the bridge, and they weren’t nearly as dramatic as the photos we’d seen. Then we realized that the best spot to see these falls was from under the bridge! 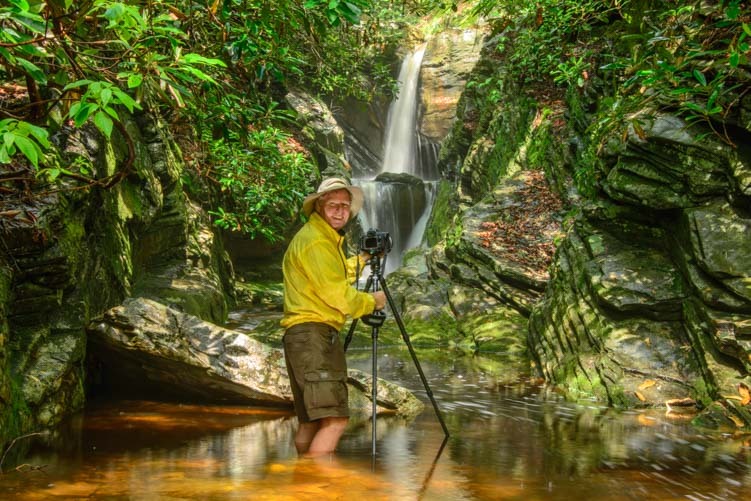 Mark waded out into the water with his tripod. The better view of the falls was from under the bridge — and out in the water! 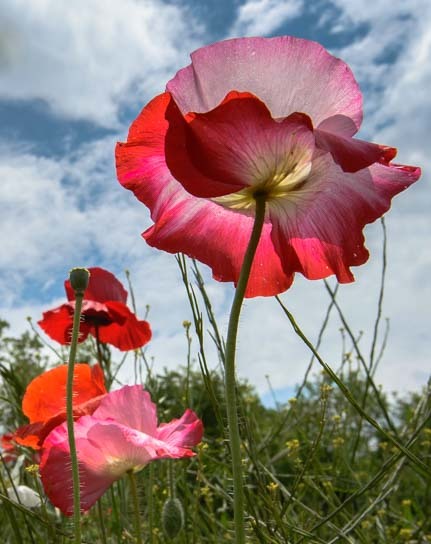 He got some beautiful photos. Suddenly, he jumped. “Ow!” He said. “I’m getting bitten!” He slapped something off his leg. It was a little lobster looking creature — a crayfish, or a crawdad thing with claws. It had crawled up his leg and nipped him! Yuck!! But the beautiful photos were worth it. 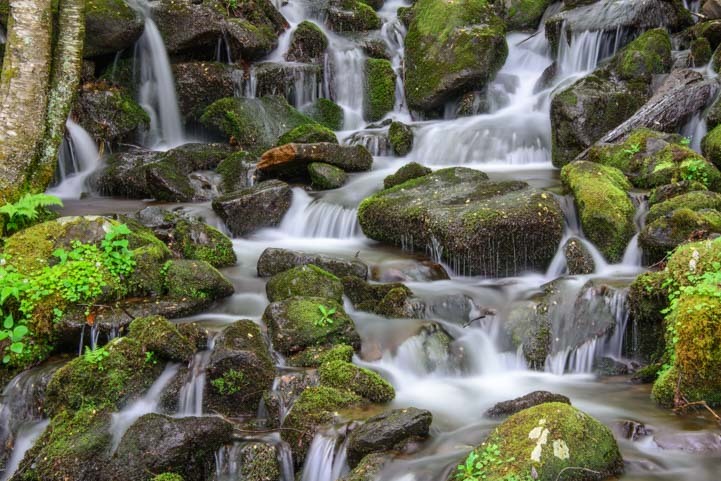 We were both playing with using long shutter speeds to make the water smooth, and soon we noticed that the foam and bubbles at the bottom of the waterfall were drifting downstream and making wonderful patterns on the surface of the water in our photos. We got a kick out of playing with the foam patterns. The foam streaked past us in all kinds of interesting lines and shapes. At one point it even flowed in a circle, and I just happened to catch that moment with my camera. I got a shot where the foam went in a circle. Cool! 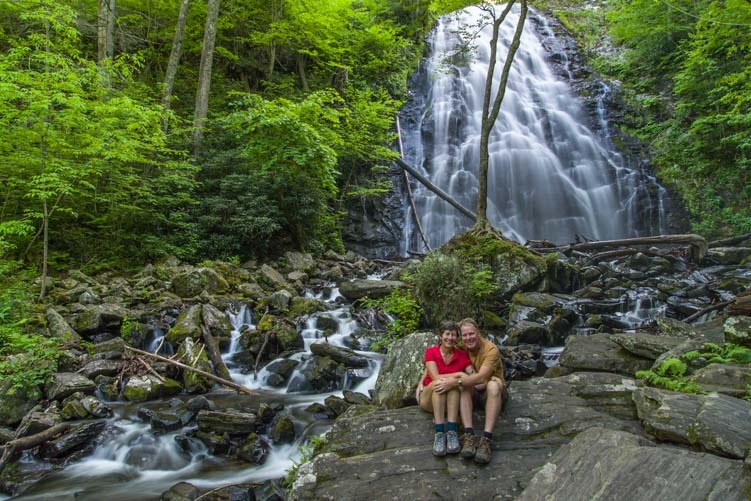 We ended up enjoying Duggers Creek Falls so much — and for so long — that we never made it to Linville Falls. Oh well. Next time! 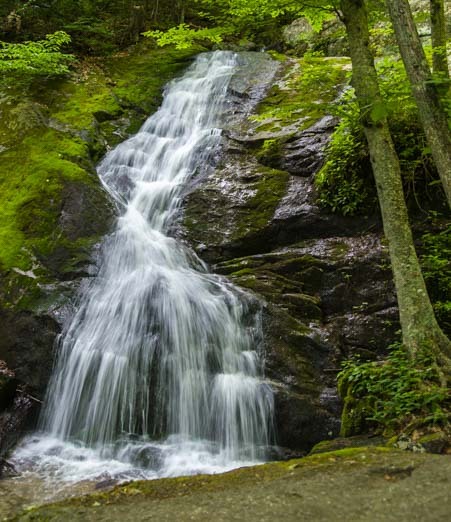 The last waterfall we visited on the North Carolina end of the Blue Ridge Parkway was Crabtree Falls. The hike down was pretty easy (although the return trip was a bit of a workout), and the waterfall was a fabulous and dramatically steep cascade over lots of big rocks. 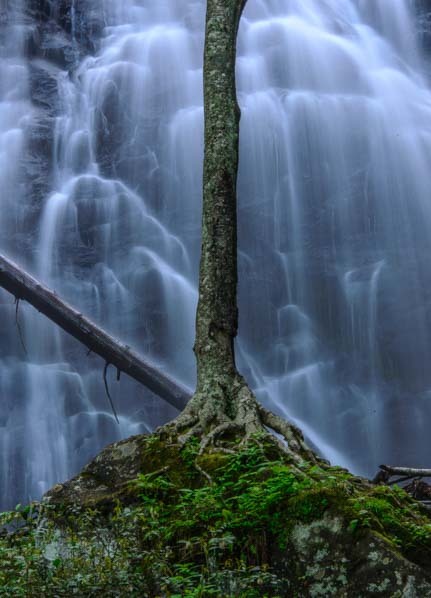 A closeup of a tree in front of the falls made for a beautiful, mystical shot right out of a Tolkien fantasy. Soon she disappeared up the trail, and we posed ourselves on the same rock to get a nice selfie. How lucky we were to be enjoying another gorgeous waterfall! 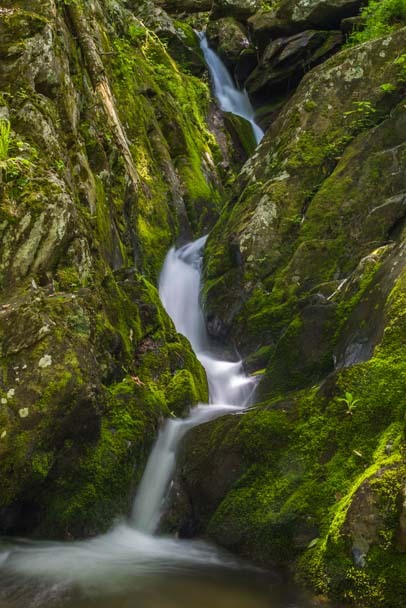 We were loving these waterfalls on the Blue Ridge Parkway! 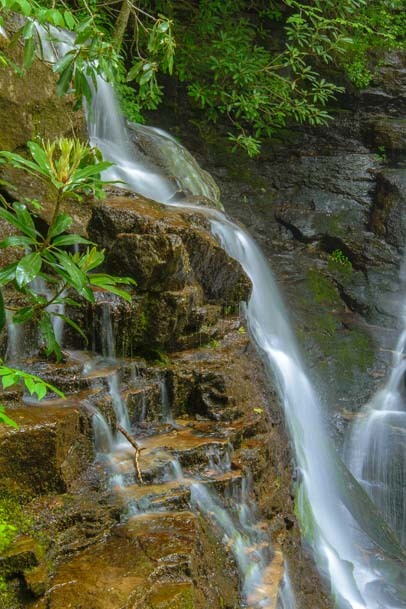 There are dozens and dozens of waterfalls along the Blue Ridge Parkway, especially at the southern end. 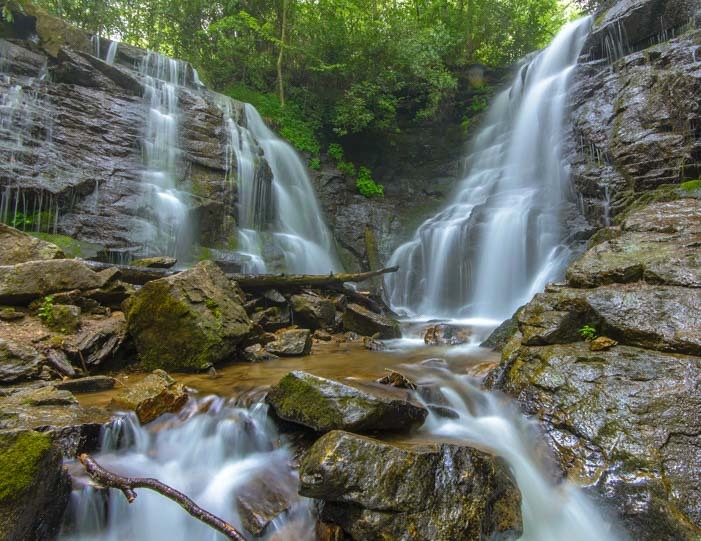 These three — Soco Falls, Duggers Creek Falls and Crabtree Falls — are all stunning waterfalls that are easy to reach. 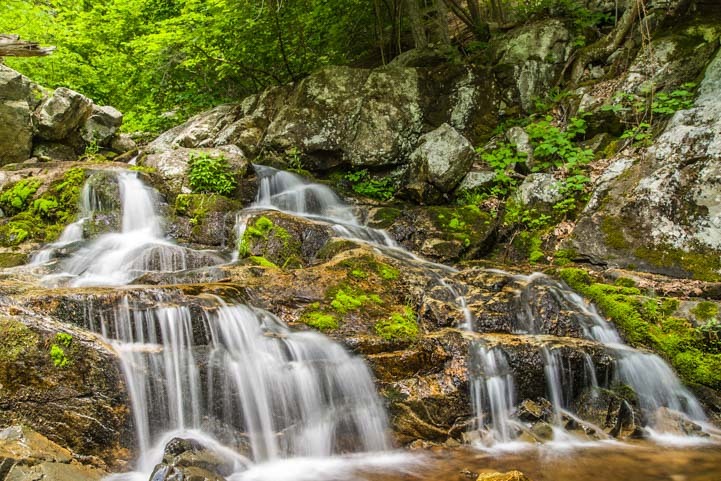 If you take an RV roadtrip along the Blue Ridge Parkway — whether driving the RV directly on it or driving on the roads nearby — any one of these waterfalls makes for a really fun excursion. 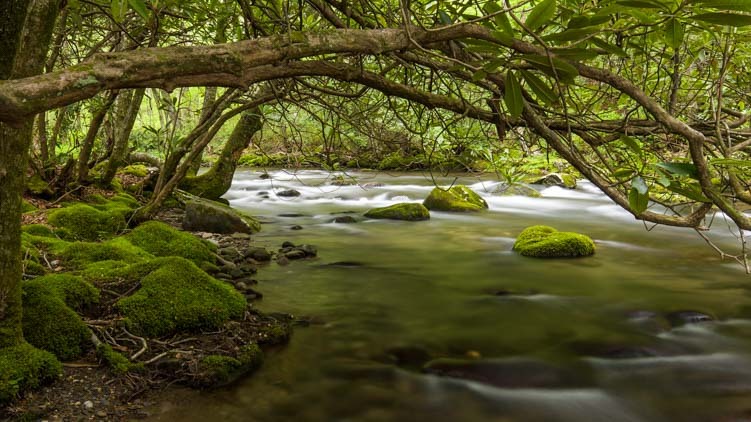 May, 2015 – The Smoky Mountains in North Carolina are filled with beautiful streams and rivers, and late one afternoon, we caught the Oconaluftee River glinting orange in the afternoon sun. Golden light on the river. 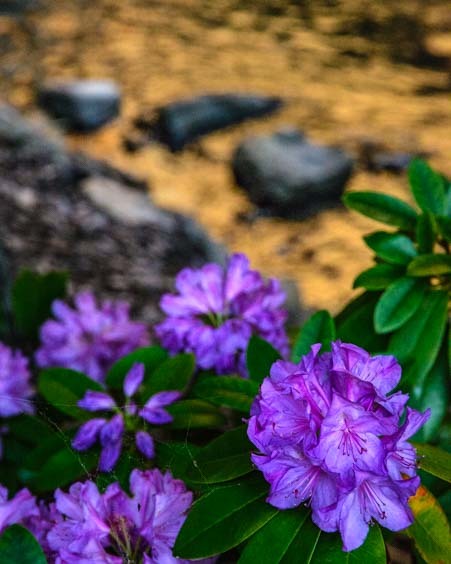 The rhododendrons had begun blooming, and their little purple faces peeked out from the edge of the glowing river water. 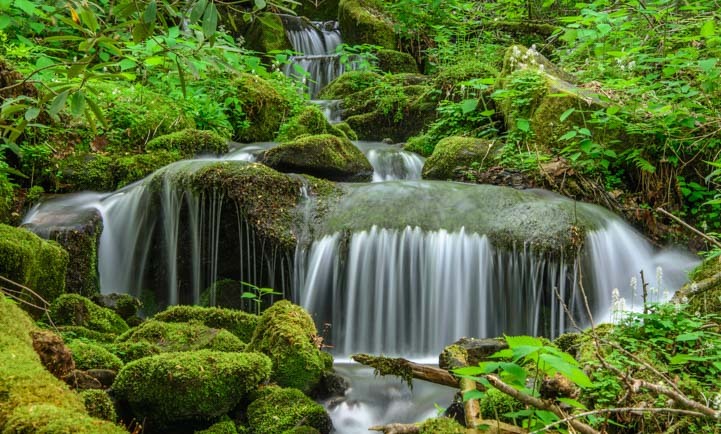 We didn’t have to stray far from the town of Cherokee to become swept up in the vivid green forests of the Smoky Mountains. 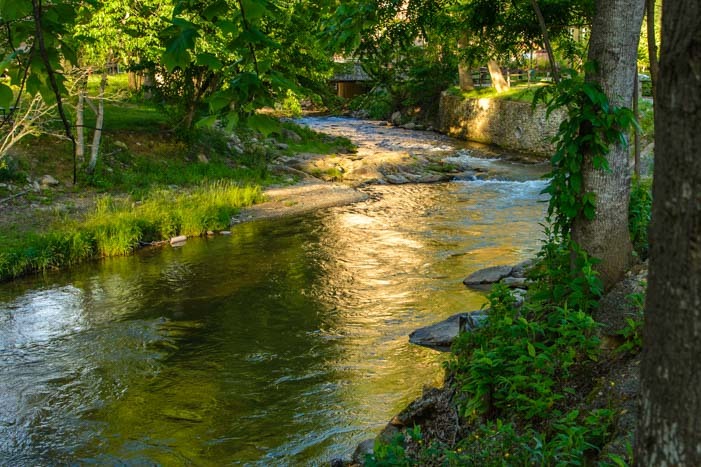 The Oconaluftee River Trail goes for about 1.5 miles from the Cherokee Welcome Center in town out to the Great Smoky Mountains National Park Oconaluftee Visitors Center. 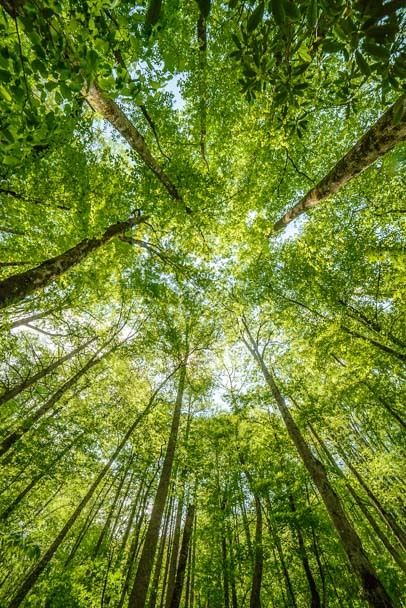 When we tipped our heads back anywhere along this path we saw trees reaching right up to the sky. 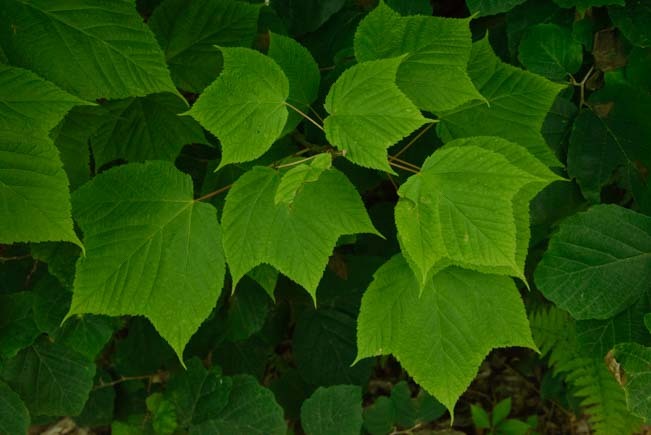 The Smoky Mountains woods are very green!! 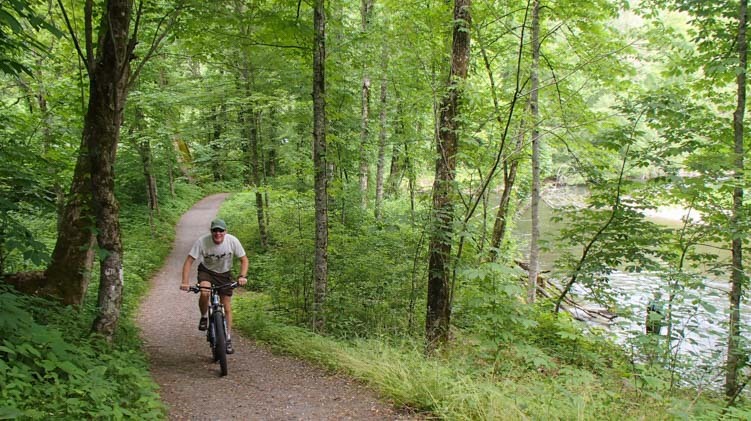 The Oconaluftee River Trail is ideal for walking, running or biking, and we took a run or rode our bikes on it most mornings during our stay. The ground is soft, and the path is wide, and no one is out there early in the morning. 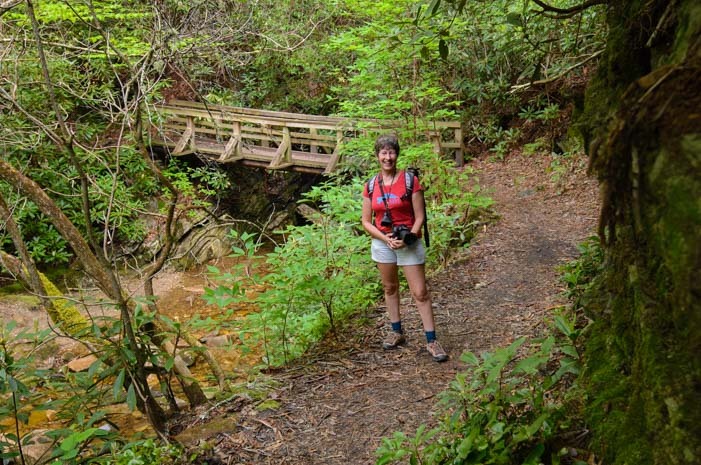 The Oconaluftee River Trail is a lovely woodsy path for walking, jogging or biking. There are signs on the trail that say elk are in the area, but who believes signs like that? Well, believe it! 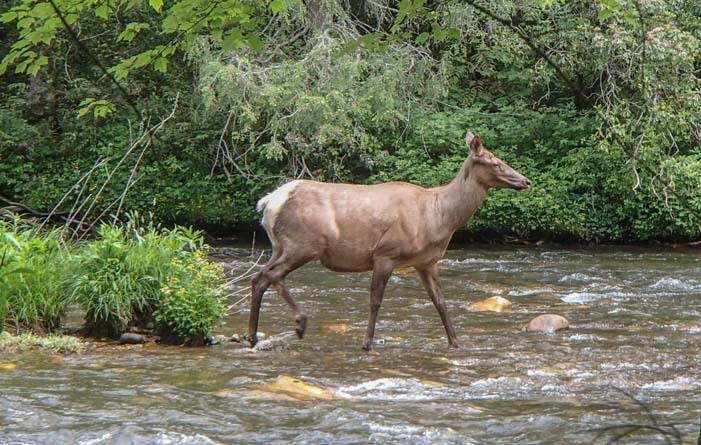 One morning Mark stopped dead in his tracks ahead of me when he saw a bull elk and his harem of females standing hoof deep in the river getting a morning drink. He could practically reach out and touch them! Where was the camera? Neither one of us had taken a camera on our run. But when we went back on our bikes one morning a few days later, we saw the elk again, and this time I had my trusty pocket camera with me. 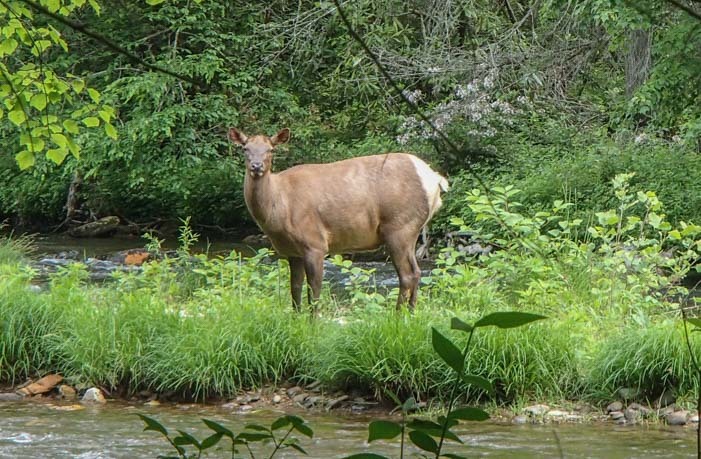 A female elk came right to the edge of the River Trail and hung out for a while, not seeming to be the least bit concerned about me as I laid my bike down and walked over towards her. 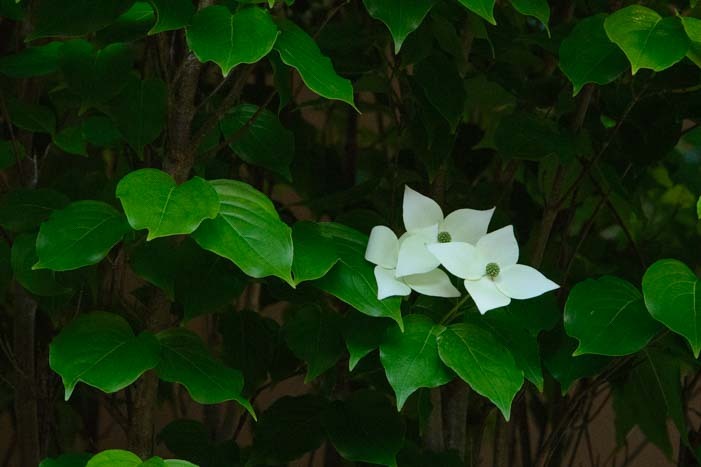 She nibbled the greenery around her and kept a close eye on me, turning her head this way and that to get a better look. This collared female elk keeps an eye on me. 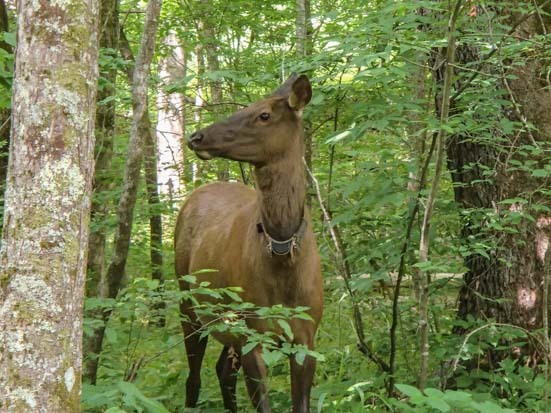 The elk in the Smoky Mountains were reintroduced in 2001-02, and this one had a collar on her so the rangers could keep track of her movements. The herd has done well, growing from 52 elk back then to 150 elk now. The elk herd isn’t the only attraction in this part of the park. 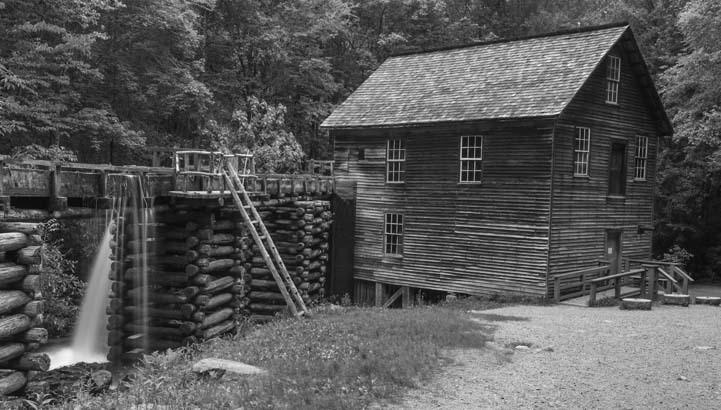 The Mingus Mill, dating to 1886, is an old grist mill that makes for some fun photo ops. 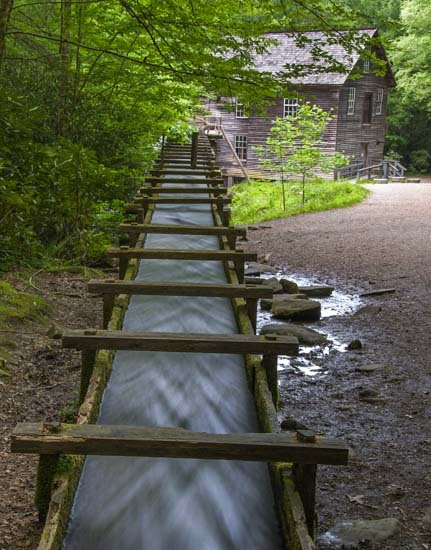 A flume of water flows down to a water-powered turbine to power all the tools in the mill. 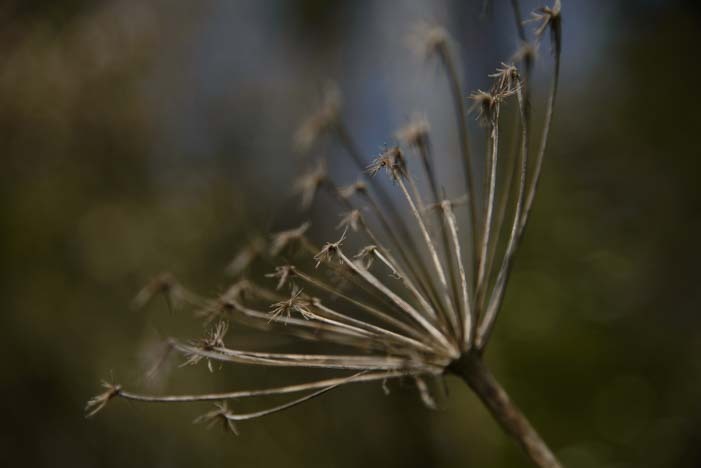 The Mingus Mill is a nice spot for artsy photography. More interesting to us was finding ways to get a creative photo of this aging building. 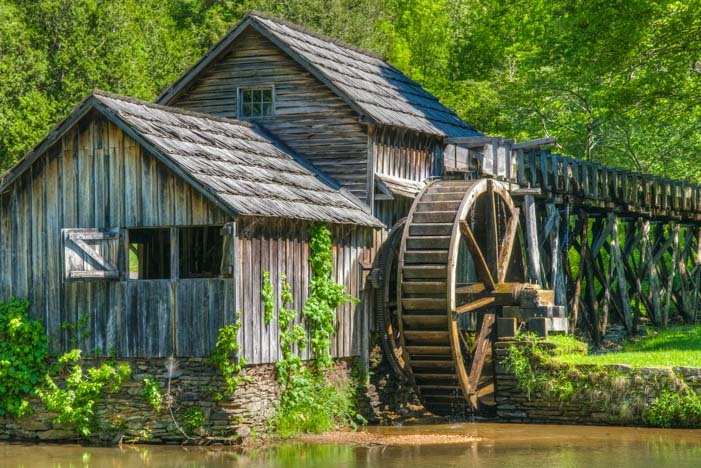 When we heard that Nikon had put on a Smoky Mountains photography workshop and spent some time at this mill, we just had to give this place a try too! 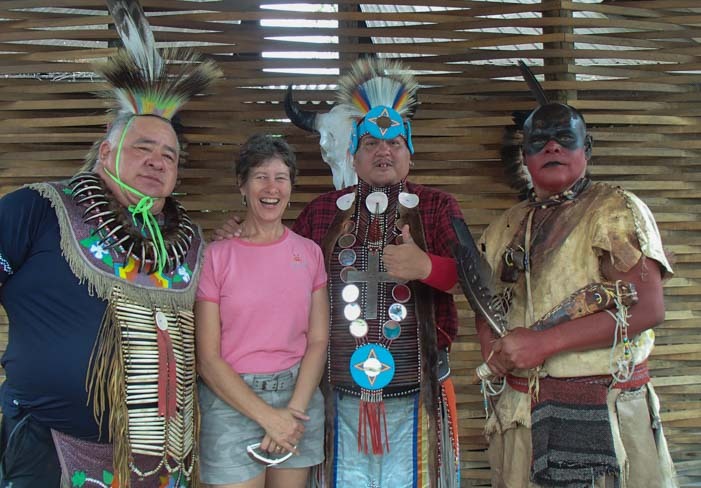 Art and nature aside, back in town we had fun watching the local Cherokee Indians perform some dances and music on the streets in town. They did an Eagle Dance and a Warrior Dance that delighted everyone watching. 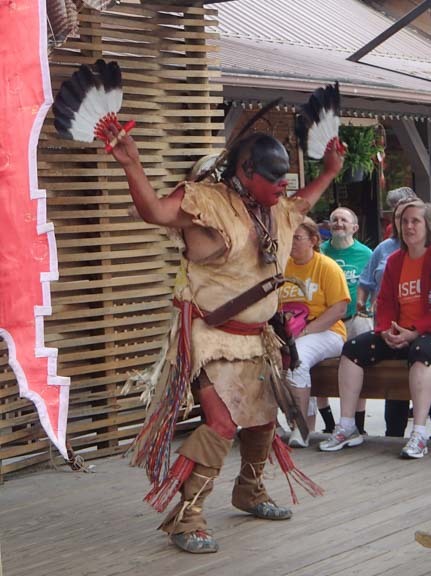 This was a fun roadside show, and all around town we saw Indians dressed in special warrior and ceremonial outfits, eager to share their history with the tourists. 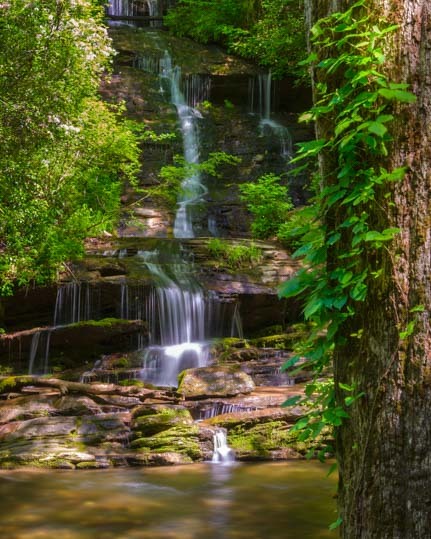 We were really loving the greenery and waterfalls here in the Smokies, and at Deep Creek in the southern part of Great Smoky Mountains National Park, we discovered there are three waterfalls you can see in just one easy hike. The first is Juney Whank Falls. It has a park bench set up right in front of it. Better than watching TV! 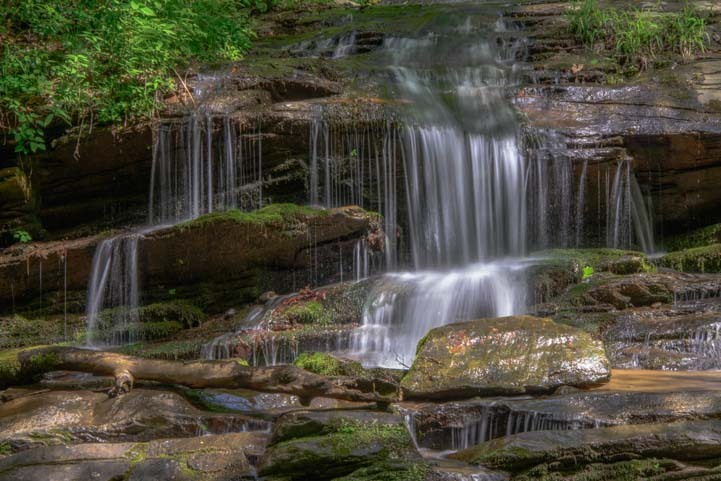 The second is Tom Branch Falls, a long skinny waterfall that snakes down out of the woods. There are park benches here too, and we had lunch and watched folks in tubes floating by on the river! Huh?! Well, yes, I do, I thought, but not that many people know about it! 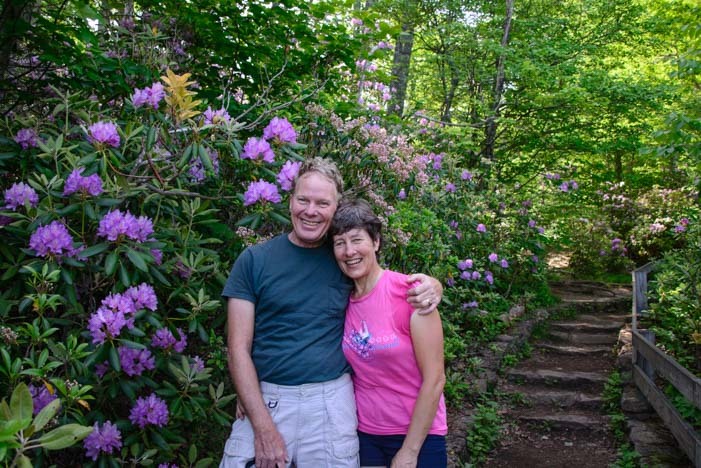 As it turned out, this couple, Dale and Linda, were vacationing in the Smokies and, with plans for more far-flung travel adventures when they retire soon, they had been reading this blog and had just seen my post about the unnamed waterfall we found on the Oconaluftee River, so they knew we were in the area. What are the chances?!! We were totally, blushingly flattered to be recognized out on the trail. Good luck, you two, and thanks for coming over to chat! A little further down the trail we found Indian Creek Falls, and in looking back at the pics now, it is neat to see that each of these waterfalls is quite different than the others. 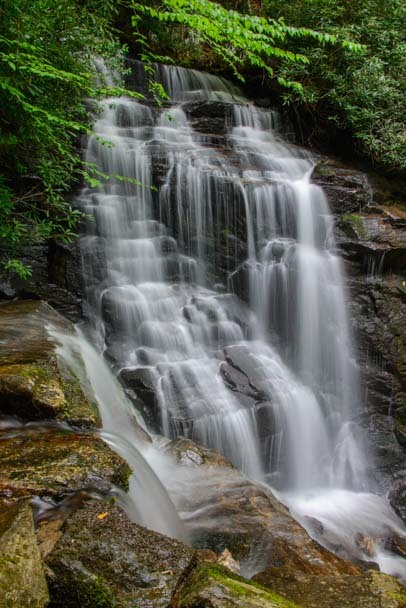 As our travels took us up the Blue Ridge Parkway in the coming weeks, we decided to make waterfalls be our travel theme, and we hiked to quite a few. Every waterfall and every hike was unique, and each was special in its own way — as you’ll see! 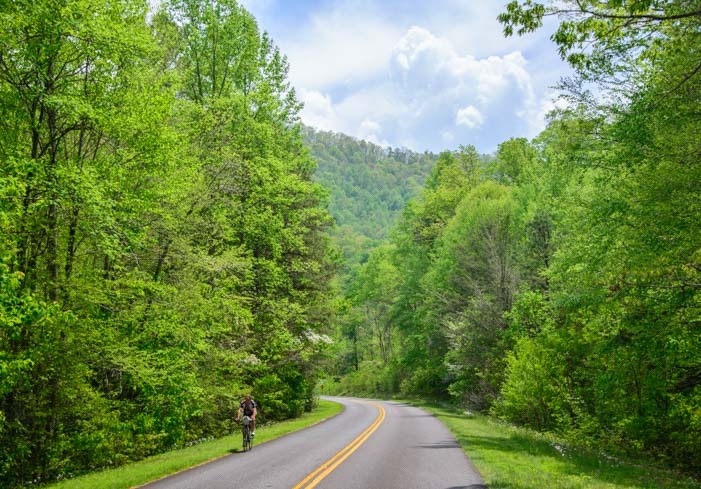 This first trip we took to Great Smoky Mountains National park was brief and very one-sided, since we stayed on the North Carolina side and didn’t explore the Tennessee side at all. 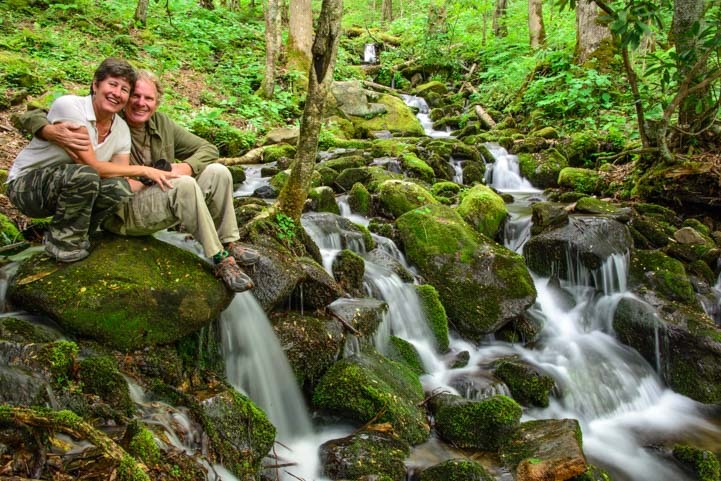 Dale and Linda told us they saw lots and lots of bears and bear cubs on the Tennessee side, especially on the Cades Cove loop, so that is on our bucket list for the next time we point our RV towards the Smokies!! 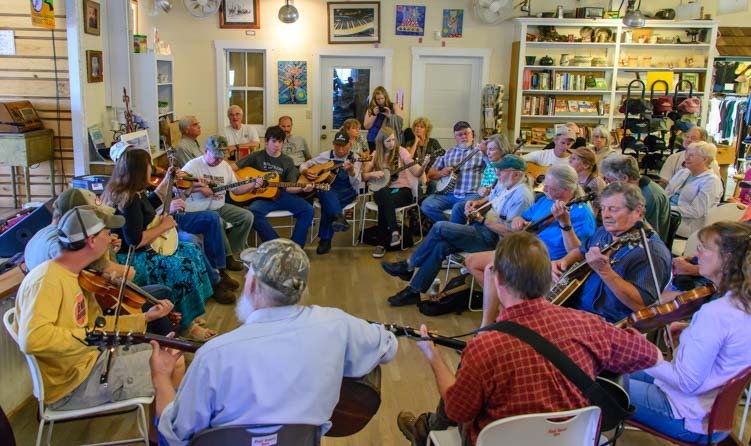 Floyd Country Store Bluegrass Music Jam – So Much Fun! 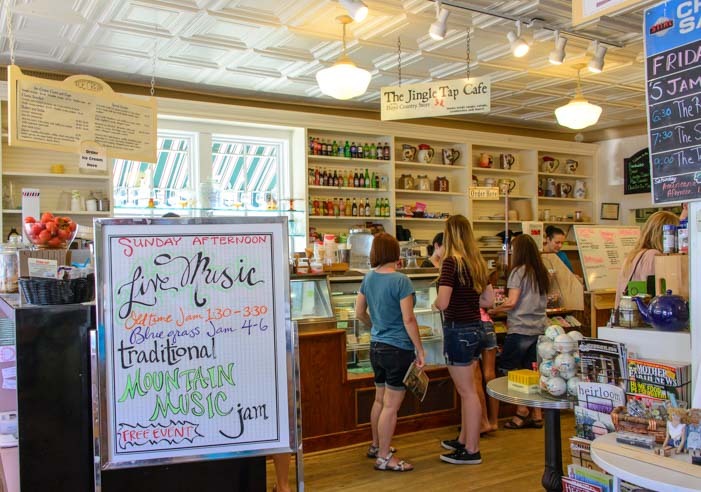 A few days ago over Memorial Day Weekend, our RV travels took us to southwestern Virginia where we were treated to an absolutely terrific musical experience: the Sunday Music Jam at The Country Store in Floyd, Virginia. 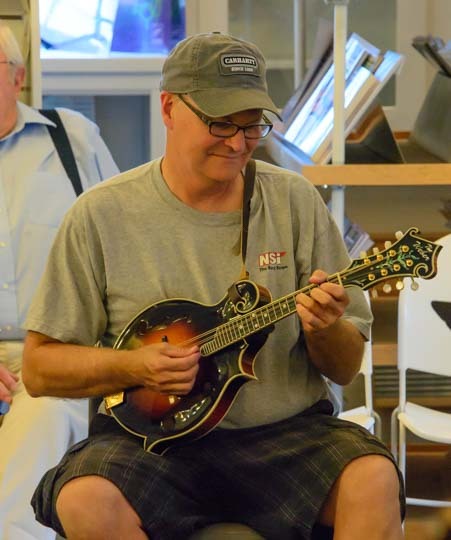 It was a free bluegrass jam session in the heart of the Blue Ridge Mountains — what a thrill! Where is this country store? 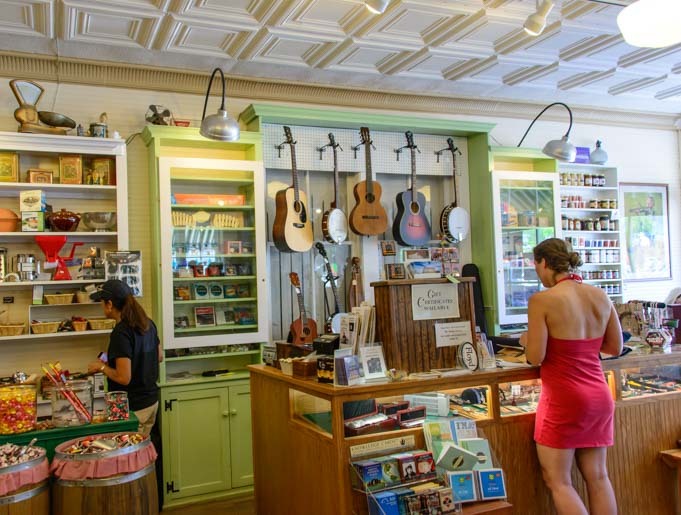 We had heard that there were fabulous free bluegrass music gigs at this unique store in the Virginia mountain town of Floyd. But when we walked down the main street under the storefront awnings, we weren’t quite sure where the store was! We saw lots of people walking around with ice cream cones. 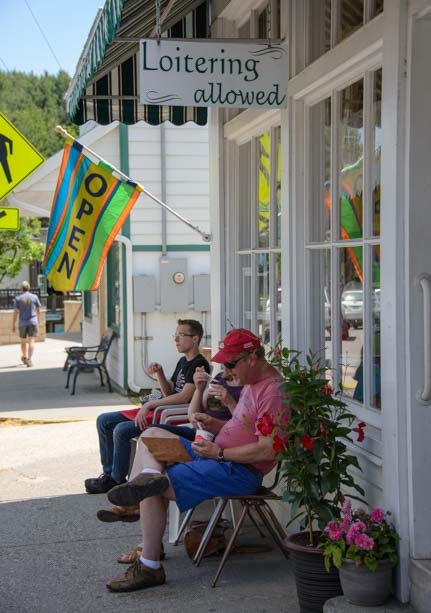 I even saw a funny sign on a storefront that said “Loitering Allowed.” I snapped a pic with some folks sitting under the sign eating ice cream while Mark walked off in search of the country store. Where the heck was that country store? We just couldn’t find it — until we crossed the street and looked back and saw that The Country Store was that funny place where loitering was allowed. Silly us!! So, in we went. 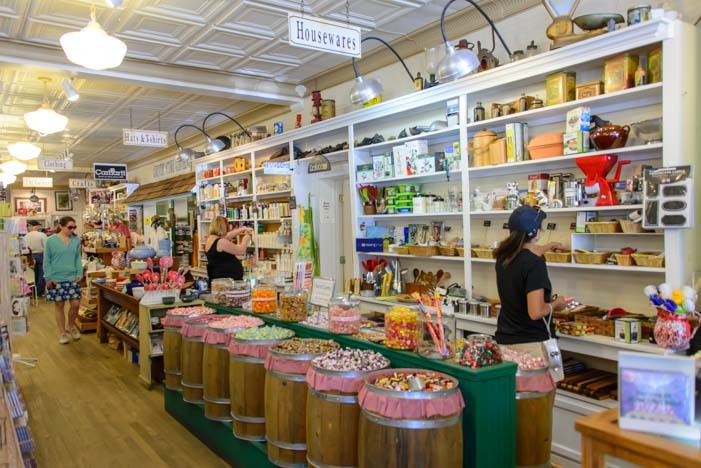 Inside the Floyd Country Store. Inside we found a classic old fashioned store, with creaky old oak floors that had been walked on by thousands of feet, an old embossed tile ceiling overhead, and big barrels of candy right in the middle with all kinds of interesting little trinkets for sale on wooden shelves on the walls. They even had musical instruments for sale on the wall behind the cash register. There were all kinds of things for sale. On the other side of the store they were selling ice cream and desserts and coffee. Sales seemed very snappy behind that counter. I noticed that for every person that marched away from the register licking an ice cream cone, another one got in line! The ice cream on the other side of the store was very popular! But it was at the back of the store where the music action was happening. We didn’t hear anything at first, but when we walked back we saw rows of chairs filled with people, many with fiddles, banjos and guitars in their laps, and there were musical instrument cases of all sizes and shapes leaning against the walls. Suddenly, without any announcement or fuss, they all began to play — and what an upbeat and happy sound that was! The musicians sat in a huge circle, all facing each other, and the folks that weren’t playing sat in rows behind them. Holy smokes — it’s a huge crowd of people making music together! We stood against a wall with great big grins on our faces — what an absolute ball this was! Suddenly, the song came to an end, and there was a little murmuring between a man and a woman up front. Then a new song began, and the whole group jumped right in again. No one had sheet music, yet they all played in perfect harmony. How cool is that! A little girl started bouncing around in her seat, and her mom leaned over and explained to everyone around her that she was fidgeting because she wanted to dance. An energetic white haired lady sitting next to me hopped up, took the girl by the hands and danced with her, to the utter delight of everyone watching. The music went on, song after song, and even after the little girl and her gracious dance partner sat down, the rest of us toe tapped and bounced our heads in time to the music, jigging along with the carefree melodies. We had just gotten warmed up when the music stopped and all the musicians began to pack it up. Oh no! But then a new group of musicians came in, sat down in those same chairs, and began to play. The bluegrass jam session begins. Host Ben Silcox is on the right. This time the sound was a little different. 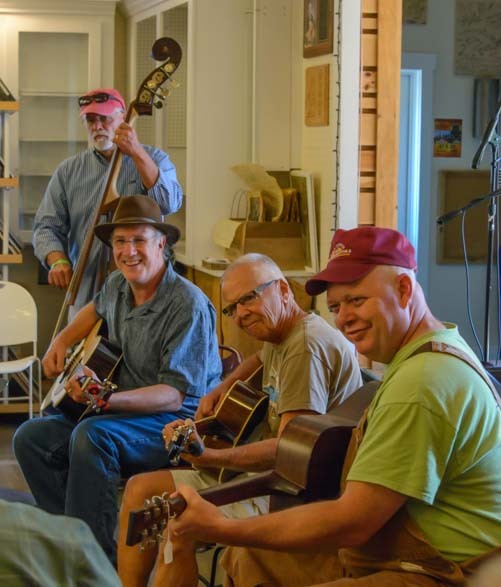 The first group had been an old-time music jam, and this group was playing bluegrass songs with vocals. The host, Ben Silcox, asked each player in the circle to lead the group in a song. Lots of people in the audience knew the words and sang along under their breath. The high spirits in this place were infectious, and we just couldn’t wipe those grins off our faces. The instruments were wonderful — mandolins and dobros along with fiddles, guitars and banjos — and these folks could all play really well. They made it seem effortless. Their fingers flew all over the place with ease! The host, Ben, told us that one member of the group was 86 years old. He was happily fiddling away. …and there were dobros and fiddles. This fiddle player is 86! “Oh, 15 of them,” his buddy responded. Ben teases his buddy about the fiddles he makes. The Country Store has been around since around 1910, but it was in the early 1980’s that it became a haven for music lovers. 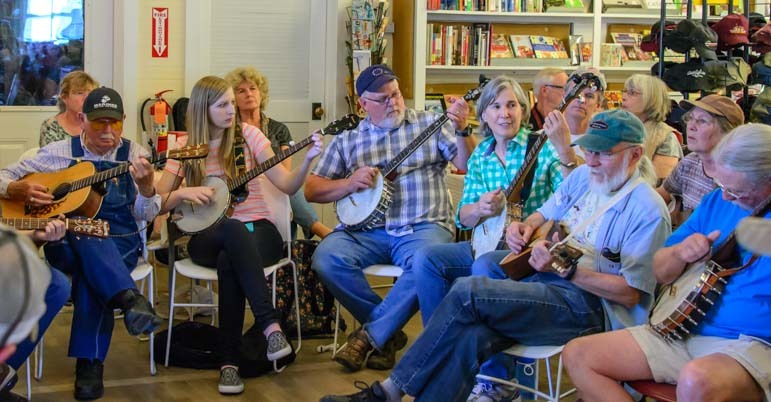 At that time, two of the store’s owners were in a bluegrass band that used the store for band practice on Friday nights after the store was closed and locked up for the day. Folks walking by outside kept knocking on the door asking to be let in so they could listen, and after a while the store owners decided not to lock up but to keep the doors open so people could stop in and enjoy the music. The Friday Night Jamboree started in the early 1980’s! A young store clerk told me she remembered going to those Friday Night Jamborees when she was a kid in the 1990’s, but that the store had been a bit run down. In 2007 new owners totally renovated the building, put lots of fun goodies on the shelves, began serving tasty snacks, and the crowds swelled. On the big music nights now, she said, the store is often packed and is standing room only! 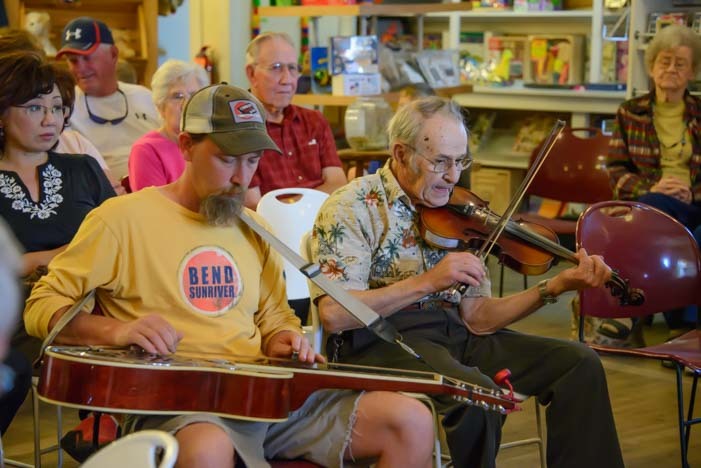 The old-time music jam was a hoot! 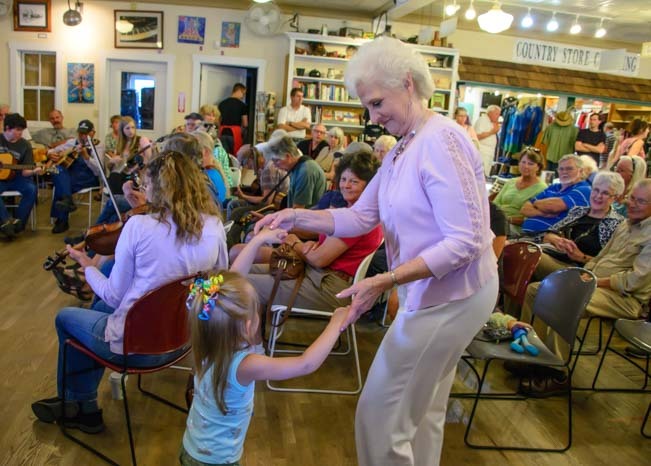 If your RV travels take you into southwestern Virginia and you want to hear some authentic bluegrass music played in the heart of the Blue Ridge Mountains, check out the schedule of events at The Country Store in Floyd, Virginia. It is a rare treat. Many weekly music jams are free, some cost a few bucks — and the ice cream is delicious! 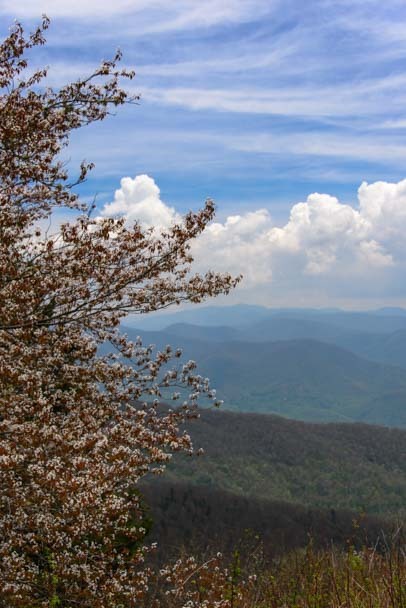 I had hoped we’d find some true mountain magic when we pointed our RV towards the mountains of North Carolina and Virginia, and when we got to the tiny town of Floyd, Virginia, we sure did! 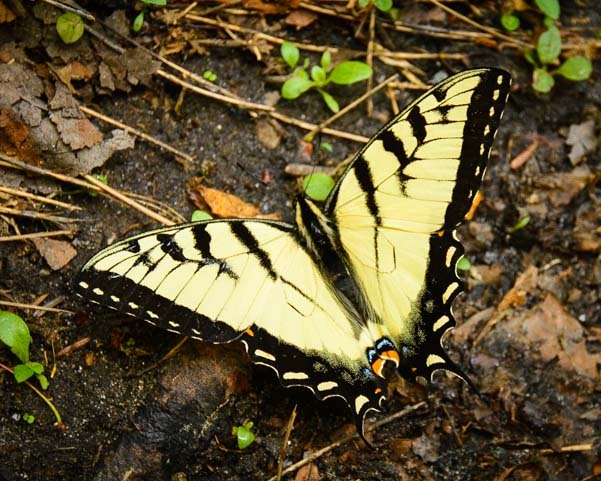 May, 2015 – We left the beautiful antebellum estates of Georgia behind us as we took our RV into North Carolina. 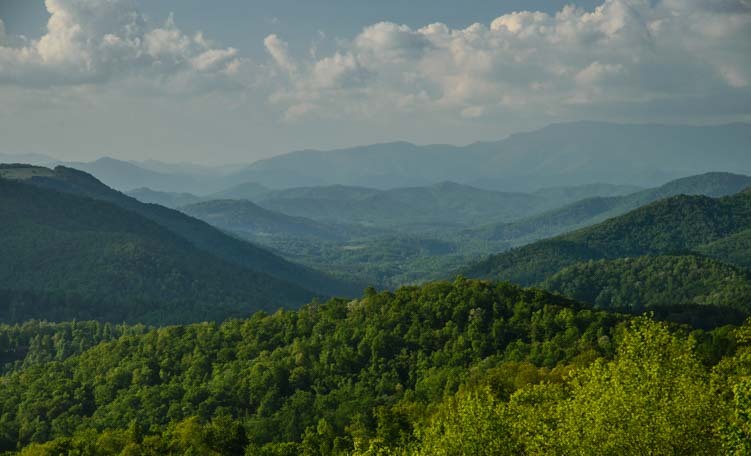 The land began to undulate beneath us, and the rolling green hills of the Smoky Mountains appeared ahead. 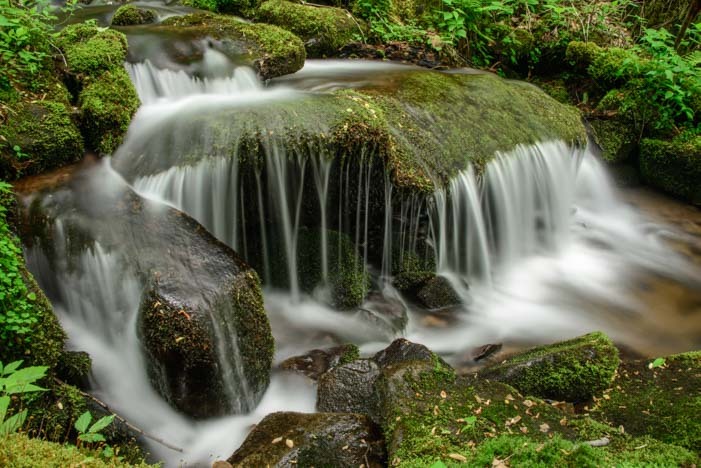 What struck us immediately during our first excursion into the park was the constant proximity of rushing water, babbling brooks and waterfalls. 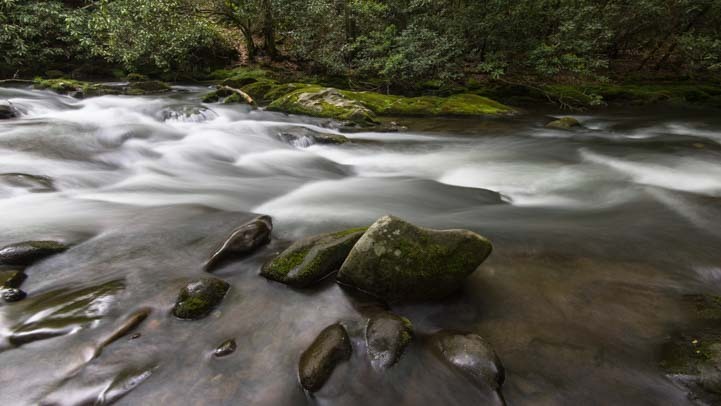 The Oconaluftee River captivated us. 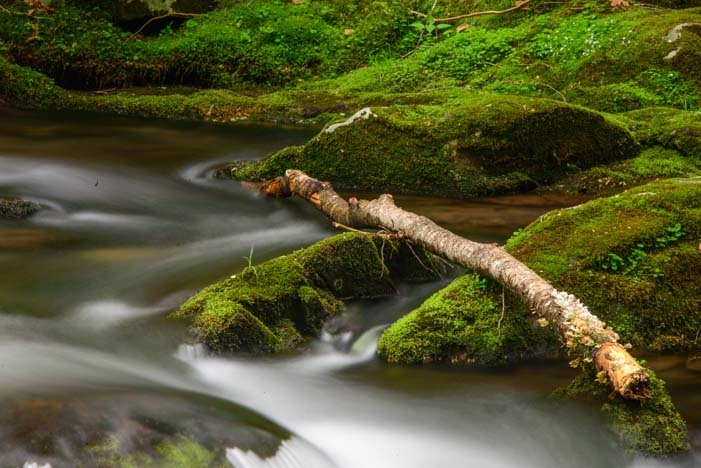 We had a blast playing with our cameras on this beautiful mountain stream, trying to catch its movement as it slipped over rocks and around logs on its way down the mountain. Water slides over rocks and past logs as it tumbles downstream. Newfound Gap Road is the main north/south road across the middle of Great Smoky Mountains National Park. It winds up and over the mountains, and for much of its length we found ourselves shrouded by an archway of vivid green trees. 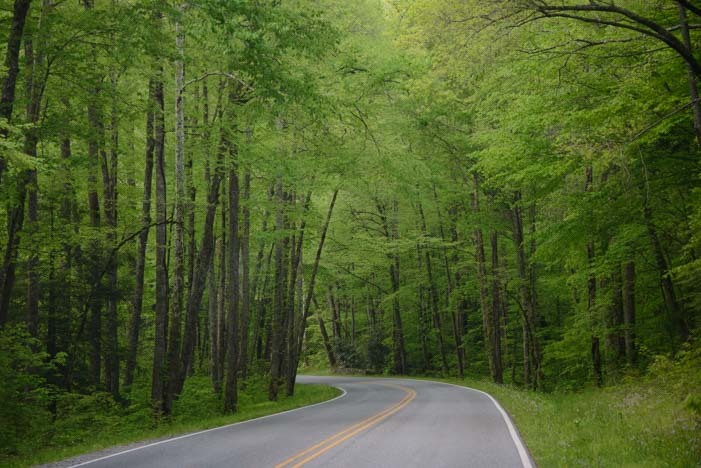 Newfound Gap Road, the main road between the north and south sides of the park, winds under a canopy of trees as it goes from North Carolina to Tennessee. The river was our constant companion, and we stopped frequently to take its photo. 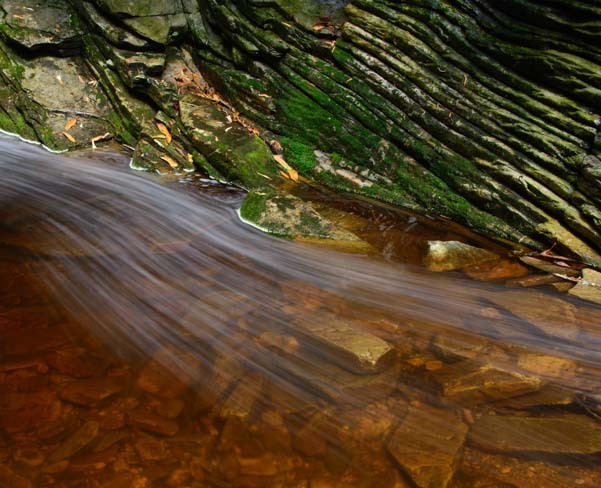 We just couldn’t get enough of all this rushing water! After about 10 or so miles and a few switchbacks on Newfound Gap Road, some openings began to appear in the trees and we were able to stop at various overlooks to get a view of the mountains stretching into the distance. Classic layers of mountain ridges in the Smokies. We weren’t immune to taking a few selfies along the way!! Everyone was taking selfies at the overlooks, so why not us too? There was a lot of traffic on this road, and most of it was motorcycle traffic. This seems to be the place for groups of motorcycles to go for a ride. Clusters of them passed us repeatedly. 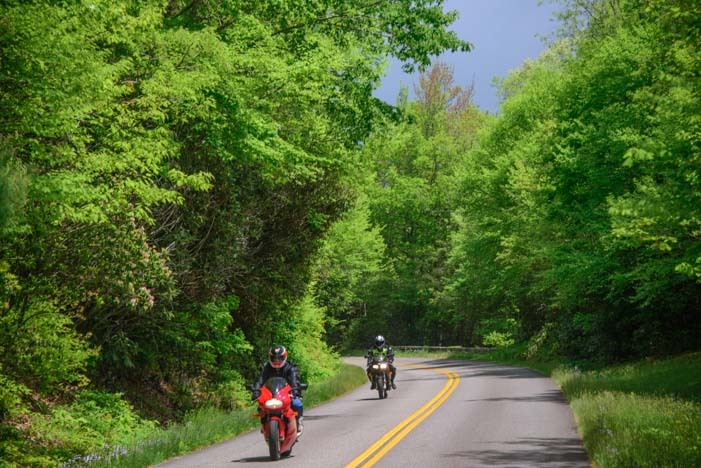 Probably the best way to enjoy the roads over the Smokies is by motorcycle — and we saw hundreds! The occasional RV uses this road to get between the Tennessee and the North Carolina sides of Great Smoky Mountains National Park too, but we kept ours on the North Carolina side for this trip. A few RVs tackled the twisties too. 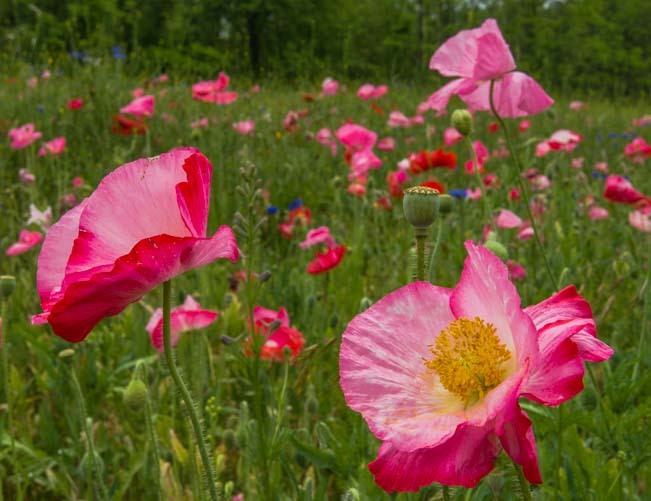 Wildflowers were in bloom everywhere. 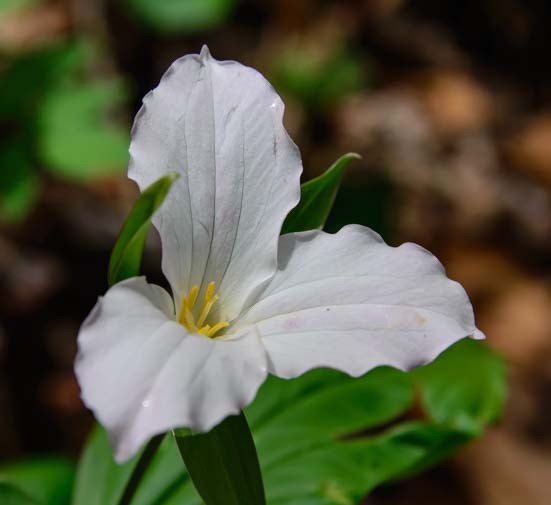 We saw trillium flowers here and there, and many other beautiful wildflowers too. 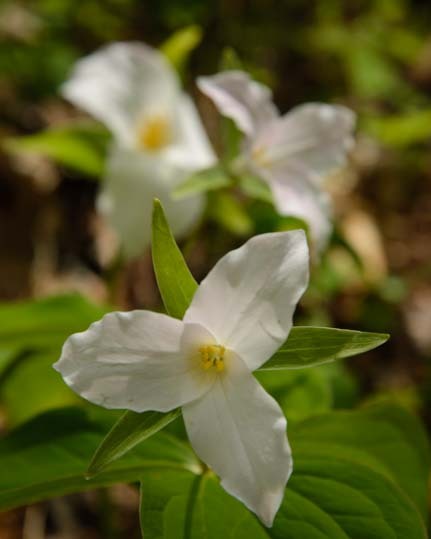 We spotted little thickets of trillium flowers in a few places. 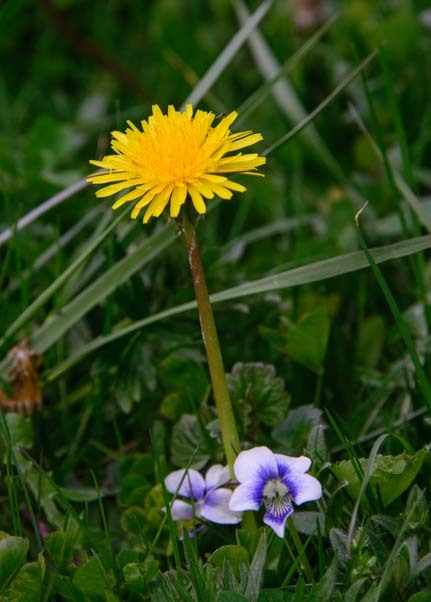 We found dandelions parading among the lavender wildflowers! 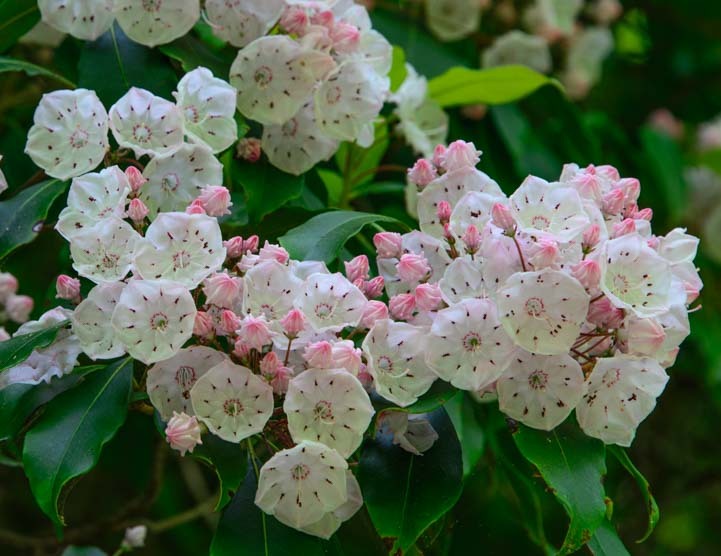 Heck, even the occasional brown weed looked good out here in the Smokies! 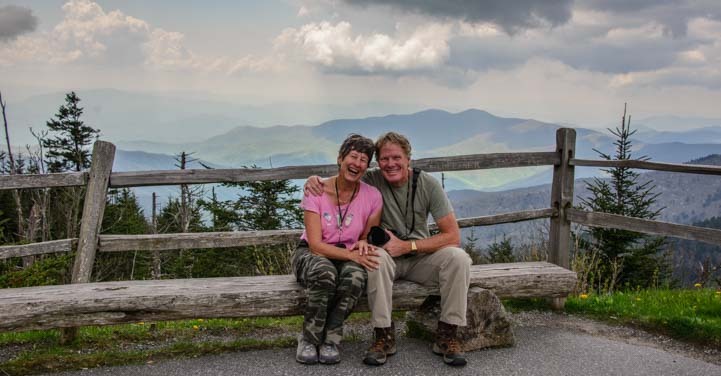 We drove out to Clingman’s Dome a few times to see the view from the highest vantage point in the park. There is a wonderful spiral walkway that goes up to a viewing platform, and the view from the top is a full 360. 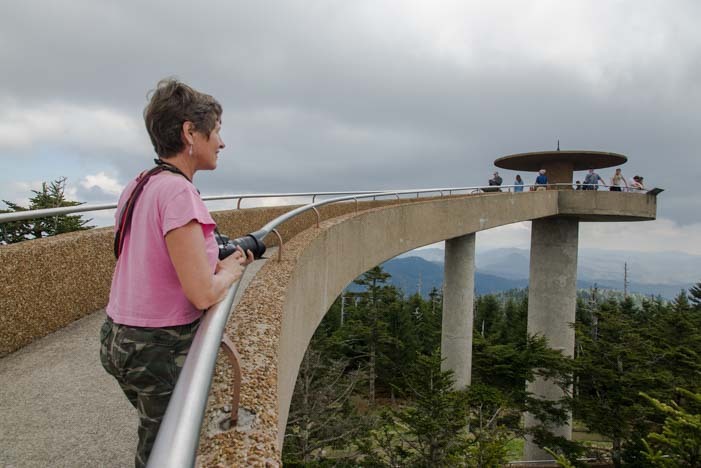 Clingman’s Dome is a marvelous ramp that spirals up to a 360 degree overlook. The layered mountains were mesmerizing at dusk as the sun set. Dusk steals over the sky. 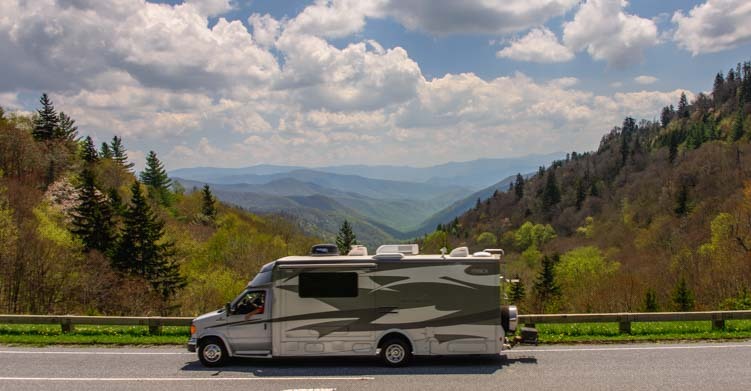 If you are planning an RV roadtrip to the North Carolina side of the Smokies, there are several RV parks in the Cherokee, North Carolina, area. 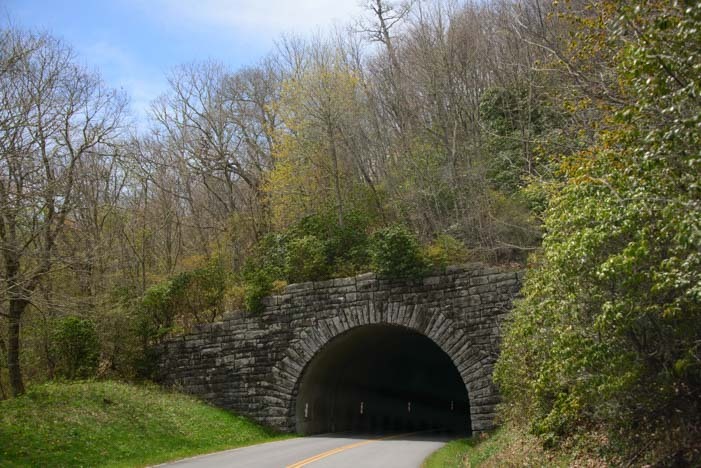 This gives you access to both the Great Smoky Mountains National Park and the southern terminus of the Blue Ridge Parkway. We saw lots of big rigs in the area, but we did find that it can sometimes be a little dicey to drive a large RV on these skinny, twisting mountain roads. 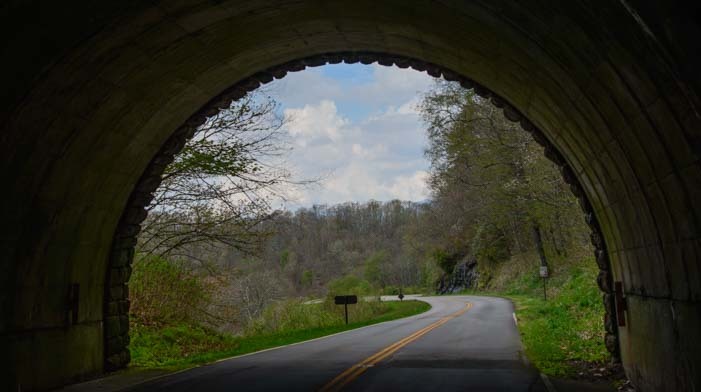 The Blue Ridge Parkway, in particular, has several low bridges in the first few miles that prevent taller RVs from driving that beginning stretch. 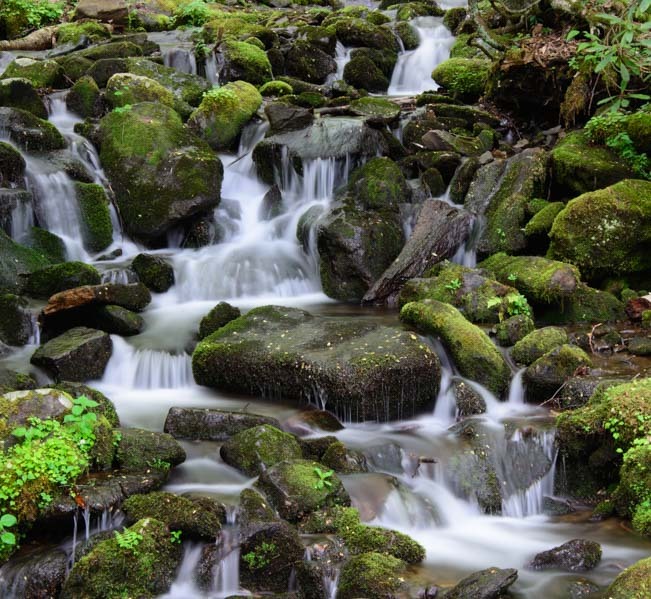 Great Smoky Mountains National Park – Official Website. Click “View Park Map” to get your bearings. 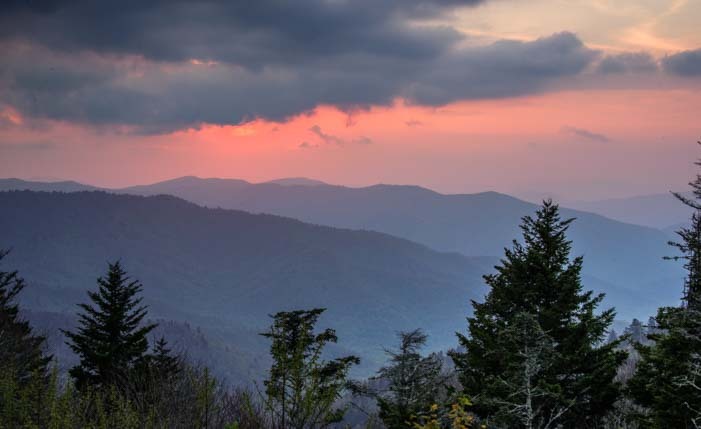 For the last few days we have been enjoying the beauty of the Great Smoky Mountains National Park and the Blue Ridge Parkway in North Carolina. These two adjacent national parks are enormous, and it can be a little overwhelming to figure out how to see it all. 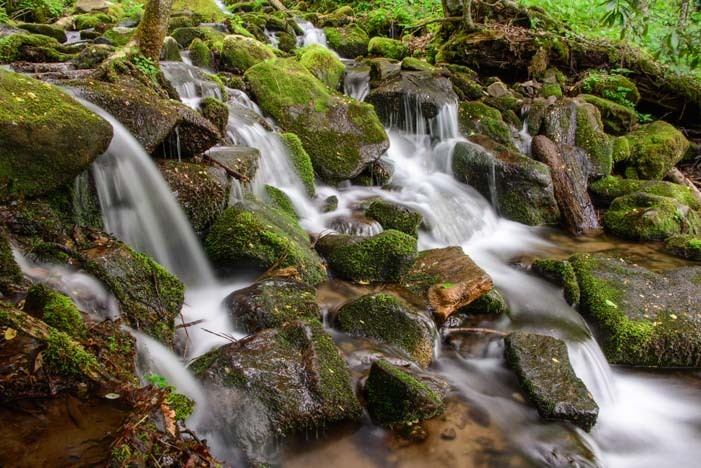 There are waterfalls and hikes and biking loops and all kinds of things to see and do — not to mention a bunch of visitors centers to help you get oriented! Just getting from one side of the park to the other can take a few hours of driving (especially if you stop to take pics all the time!). 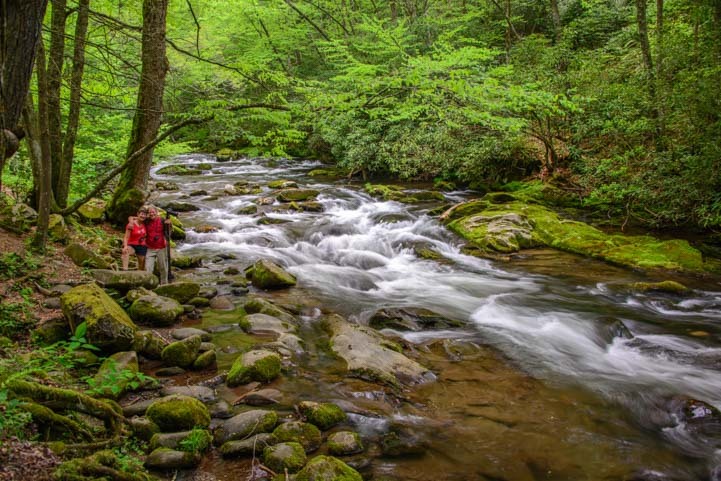 We did a few drives and saw some lovely things, but these two sprawling parks didn’t really capture our hearts until one afternoon when we accidentally bumped into a true jewel by the side of the main road that scales the peaks of Great Smoky Mountains National Park. 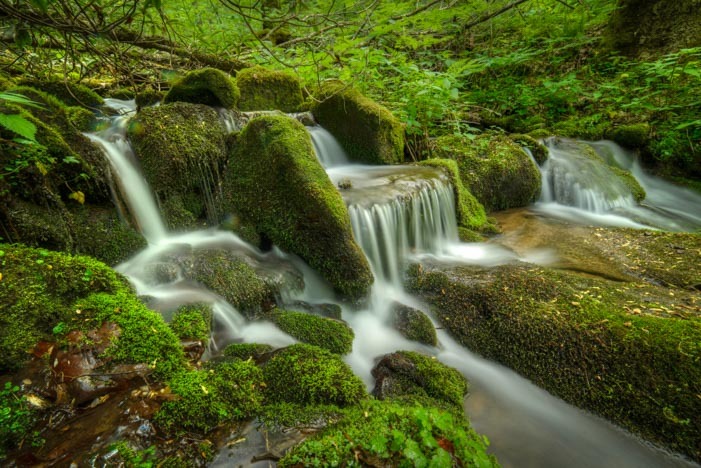 We were just driving along when out of the corner of our eyes we spotted a fabulous waterfall cascading down the vivid green hillside. Mark did a quick U-turn, and we rushed back to find a place to park so we could run out and see this gorgeous waterfall up close. Before I jumped out, I scanned the maps, but there was no mention of this glorious waterfall anywhere. And there were no road signs marking this stunning gem either. There was barely room for a three or four cars to park! We scampered up the steep, muddy trail alongside the waterfall. 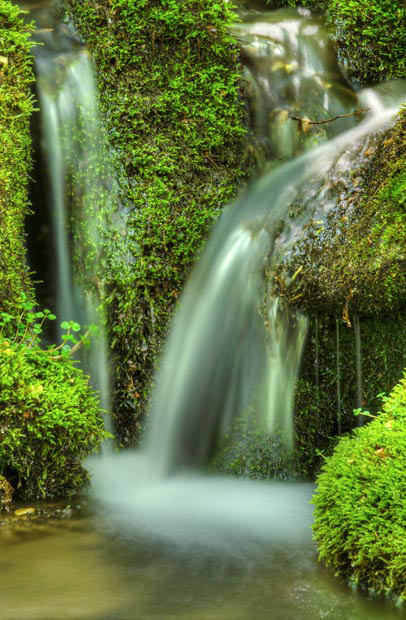 The stunning cascade went up and up and up, disappearing into the lush green woods high above the highway. 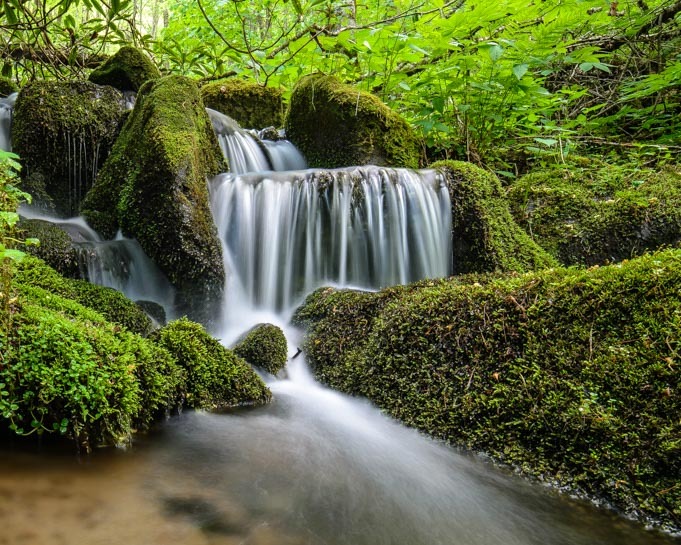 We followed the lure of pretty arcs of water washing over moss covered rocks until we felt like we were in the treetop canopy. What a discovery!! We clambered around and took photos for hours, thoroughly enjoying this perfect, unnamed and unsung showpiece in this mammoth park. 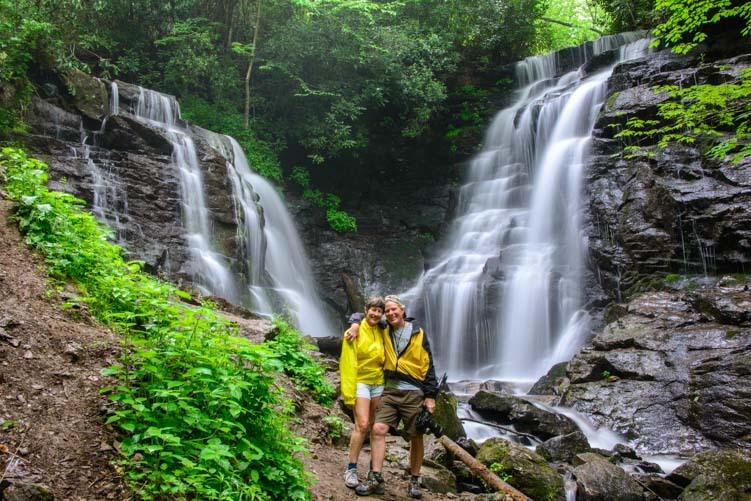 We’ve been reading up on all the waterfalls there are in the Smokies and along the Blue Ridge Parkway — there are dozens — and we’ve checked the photos of them all. But this unknown one keeps calling us back. 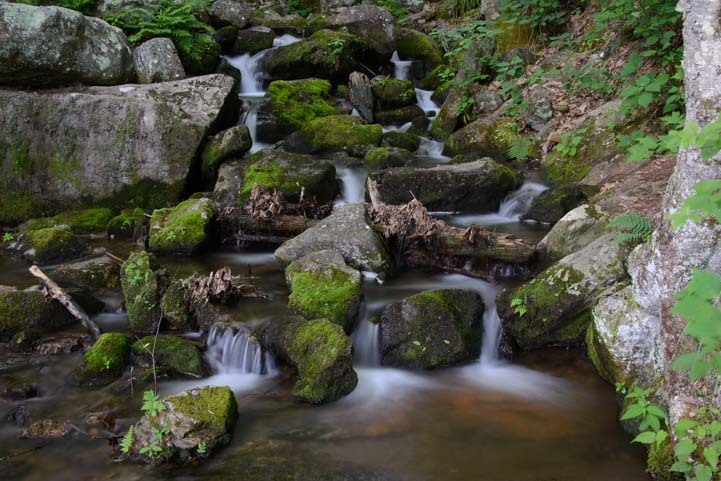 It is so beautifully balanced, with water tumbling down a magnificent pattern of rocks. 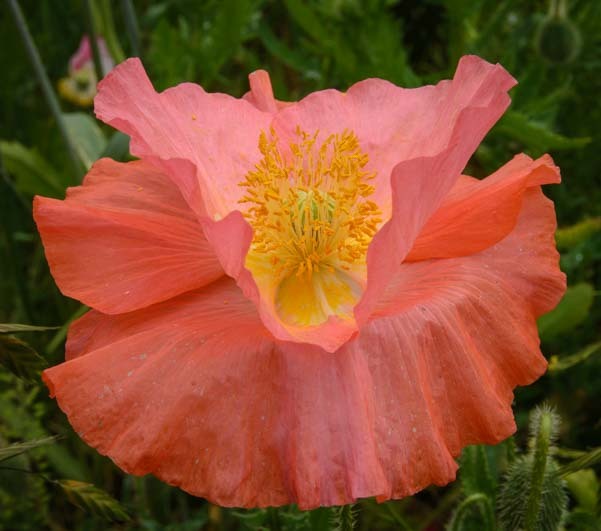 There is no doubt that this was one designed by a divine hand. So far we’ve visited three times!! 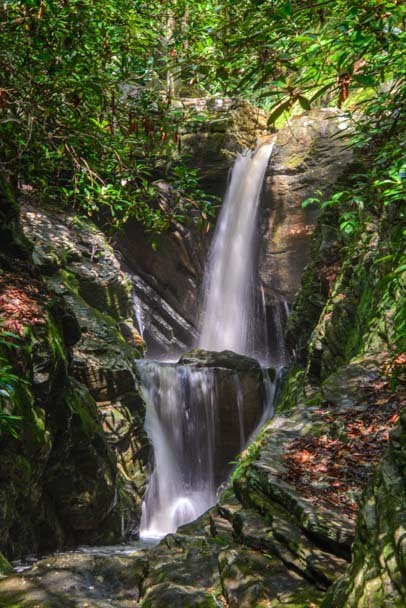 If you take your RV to Great Smoky Mountains National Park in North Carolina, I’m sure there are loads of beautiful waterfalls to see — we’ll be finding out in the coming days and weeks and reporting back about what we find. 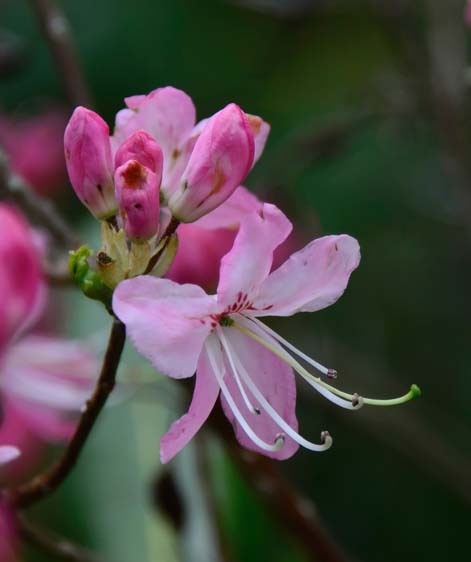 But be sure to check out this unmarked beauty. 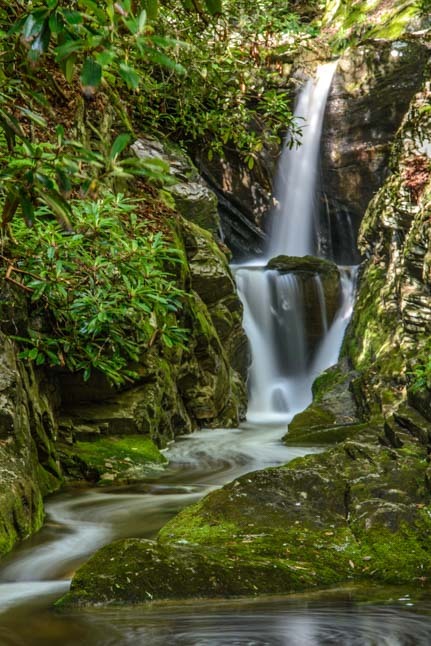 From Cherokee, North Carolina, the waterfall is located 8.5 miles west of the Oconaluftee Visitors Center on Newfound Gap Road on the left hand (south) side. You won’t see it as you drive west from the visitors center, but if you drive out about 10 miles and then turn around and come back east (towards the visitors center) slowly, you’ll see it flowing oh-so-happily on the right.